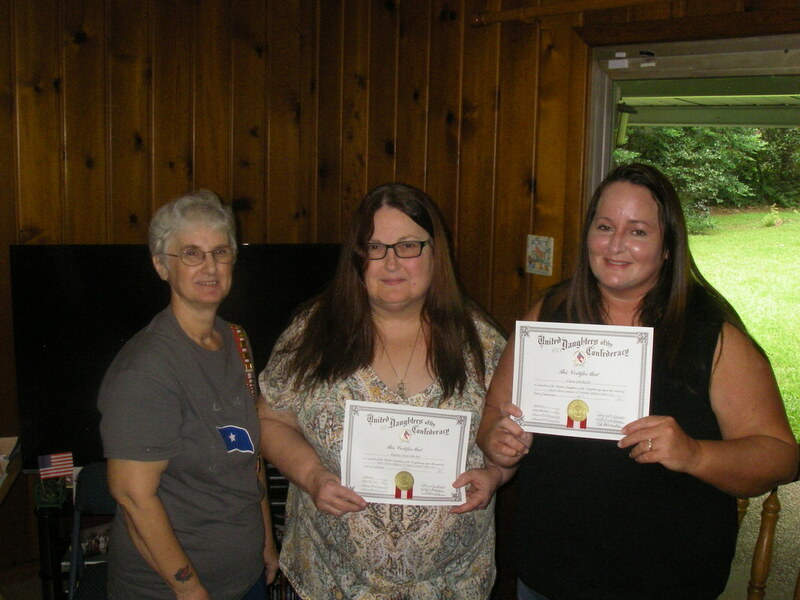 Mother and Daughter Regenia Mitchell and Carey Mitchell Keith receive their Membership Certificates. 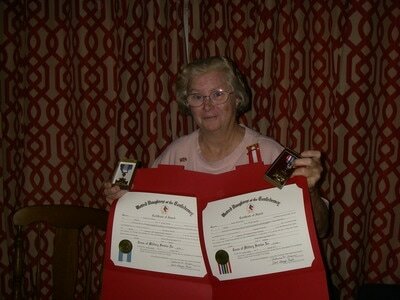 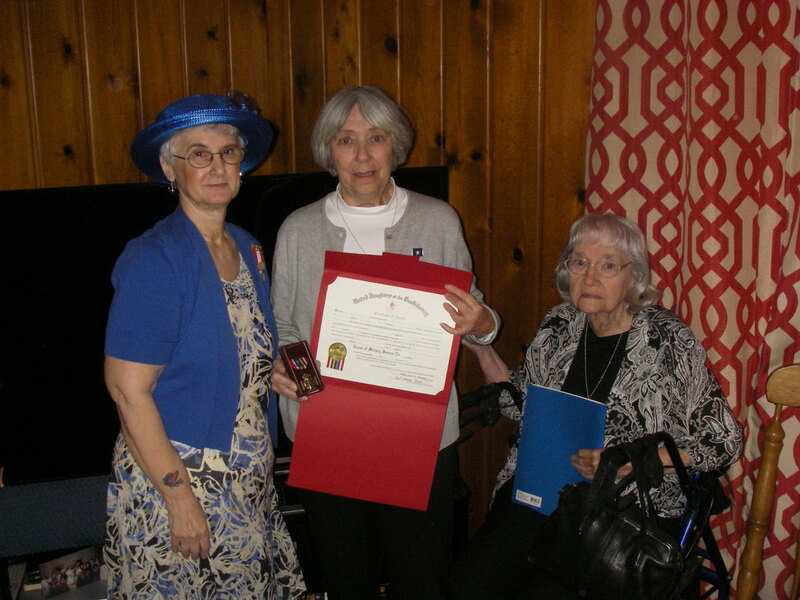 Margaret Lynn Ellis presented a WWII Military Award for the service of her father. Pictured with her is her mom, June Arnold. 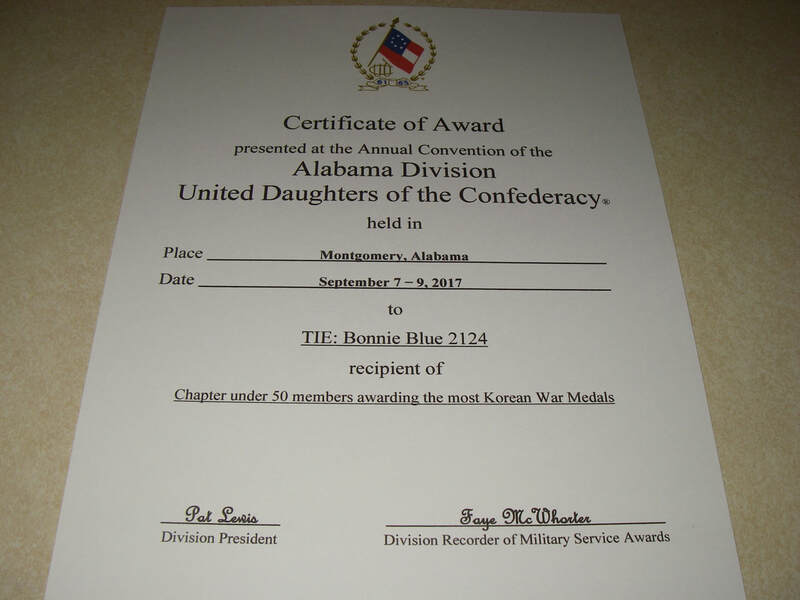 World War II and Korean War Crosses of Military Service Awards Presented to Belinda Roberts for her uncle Romeo Ray Roberts. 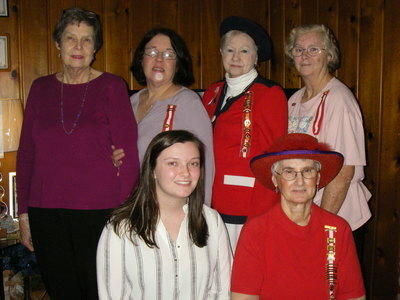 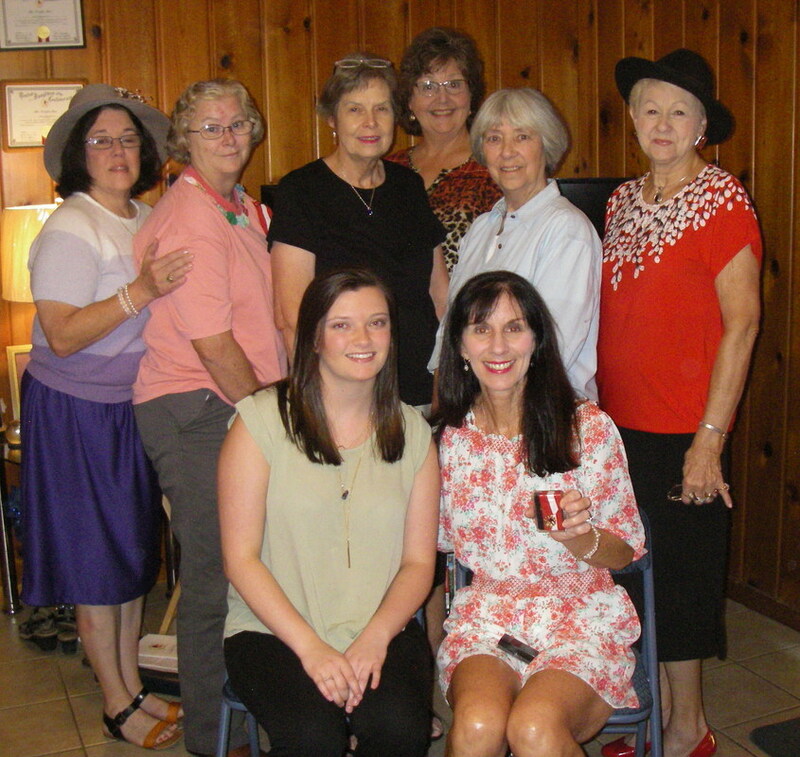 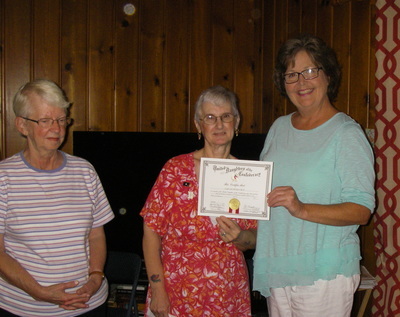 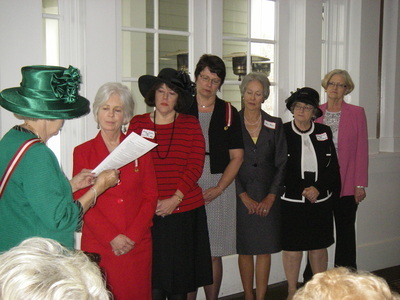 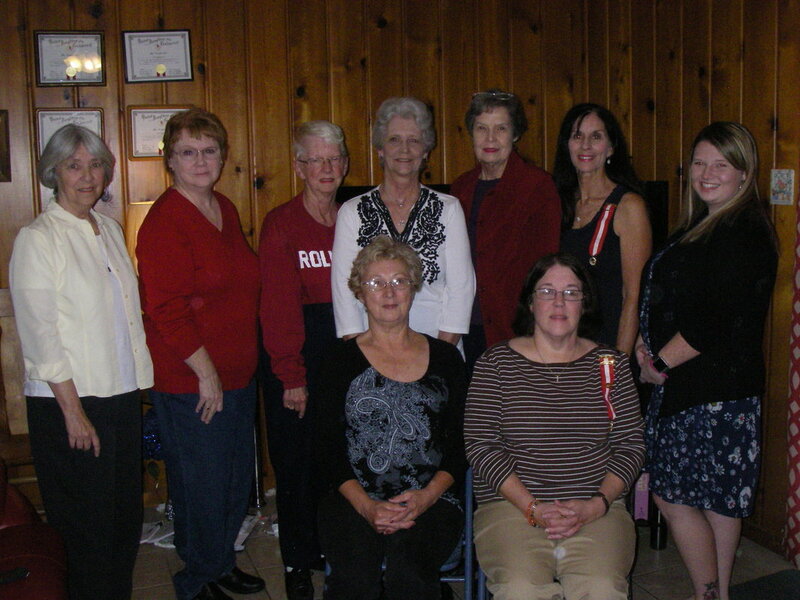 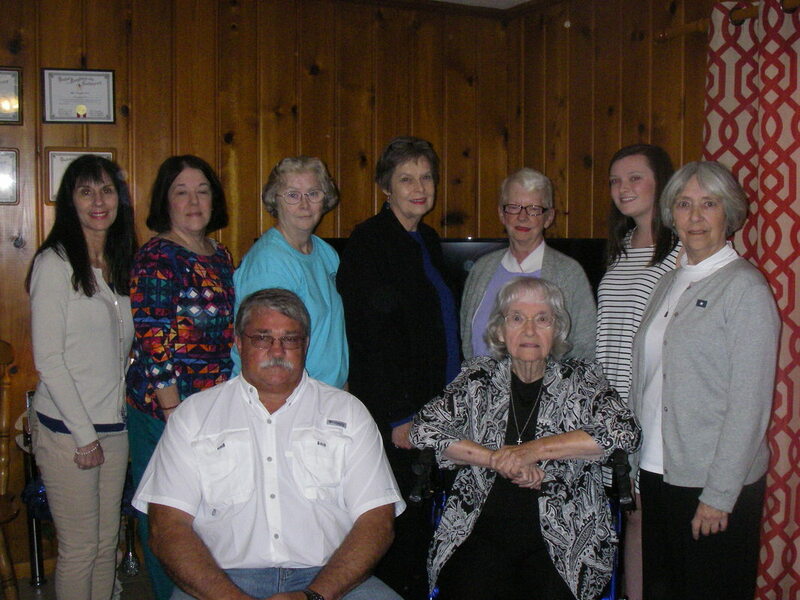 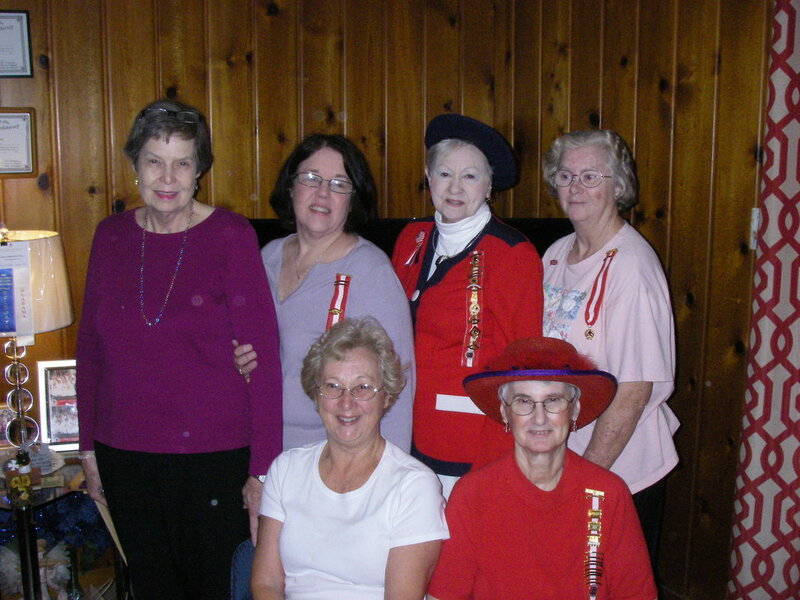 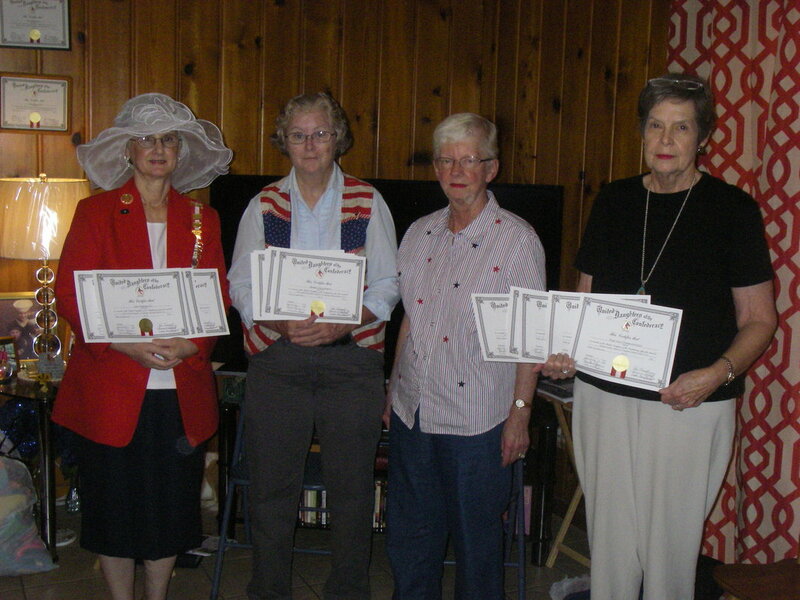 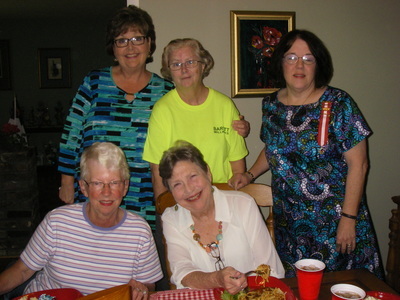 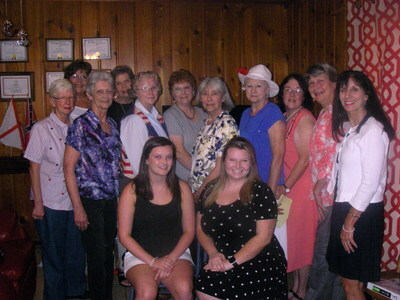 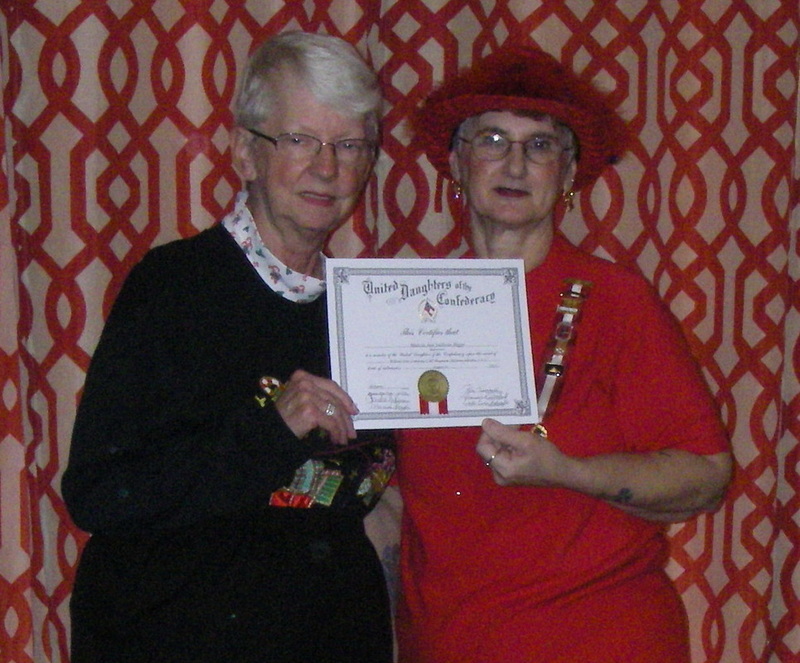 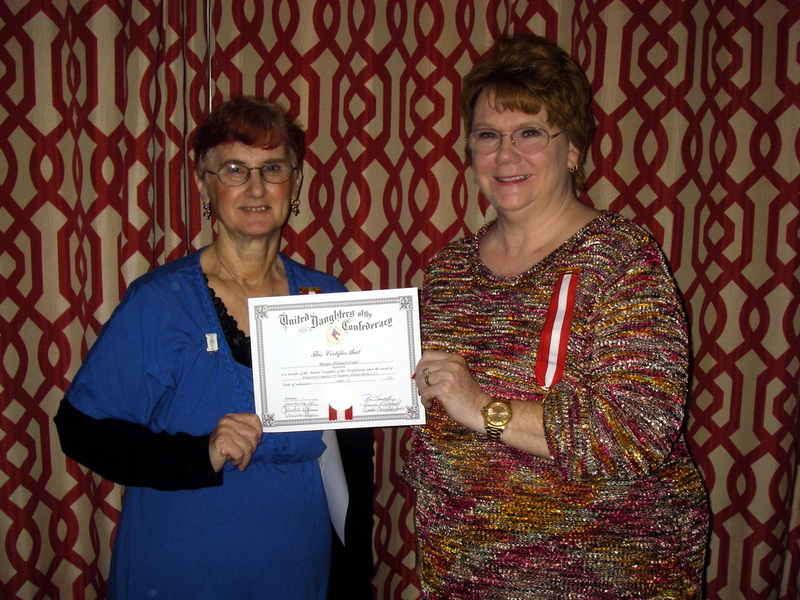 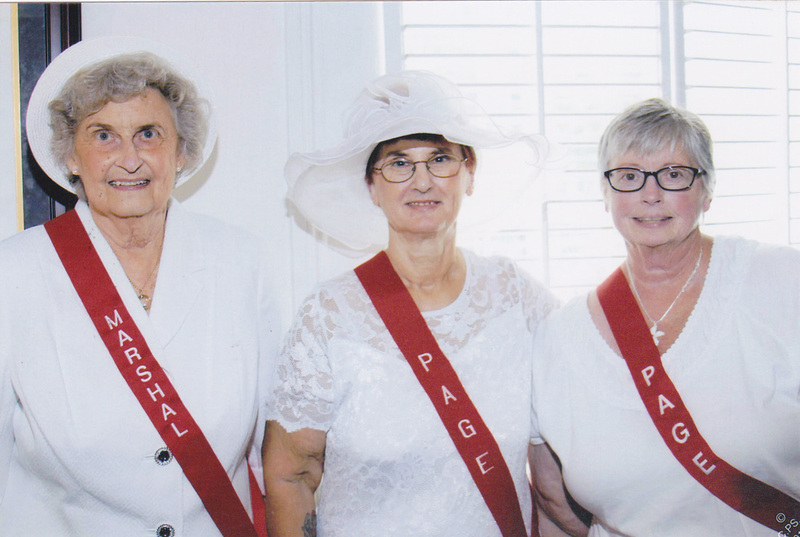 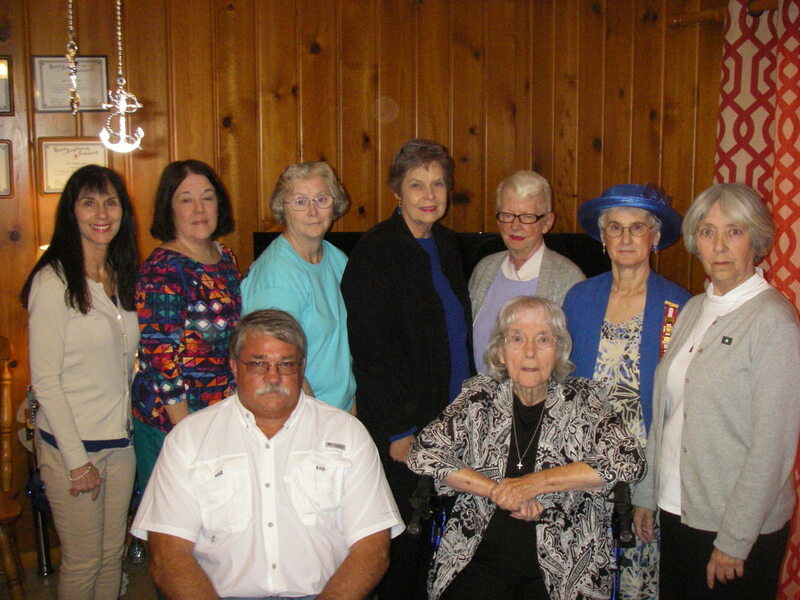 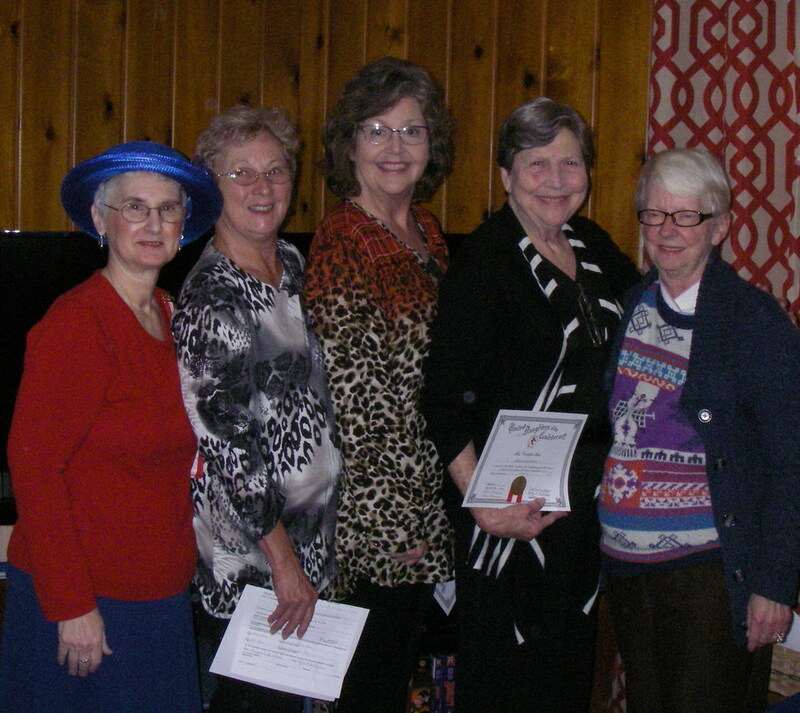 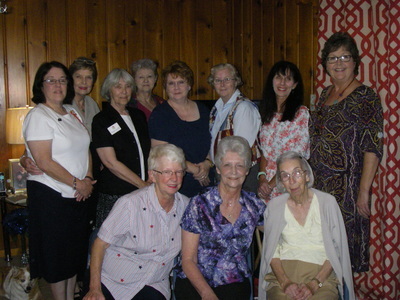 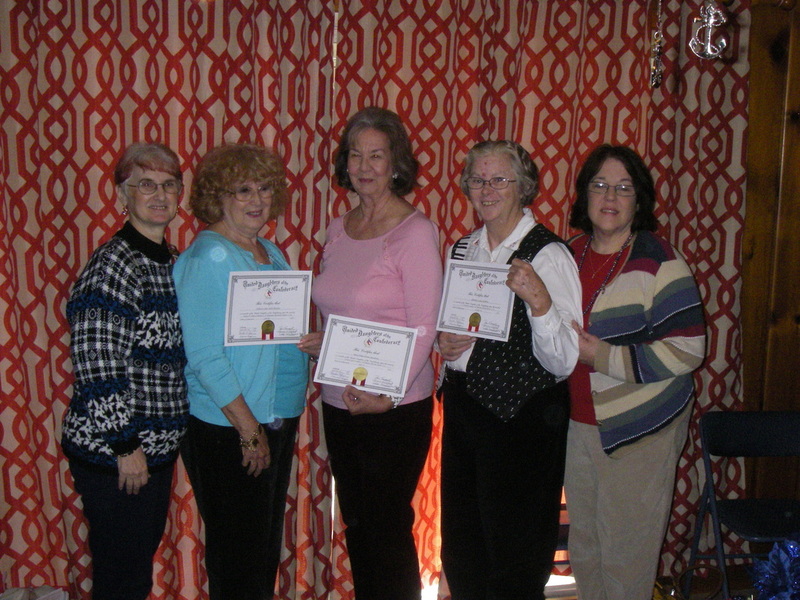 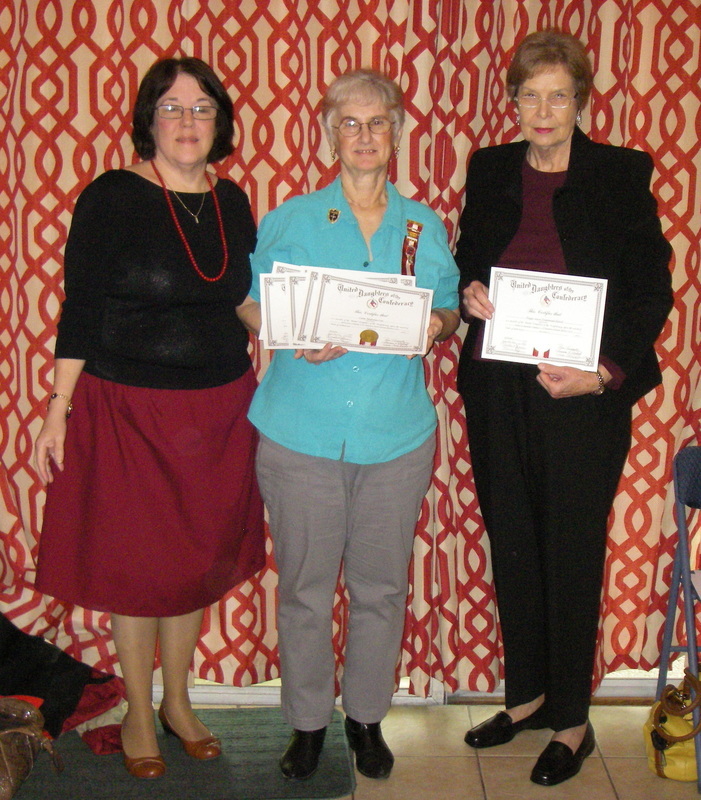 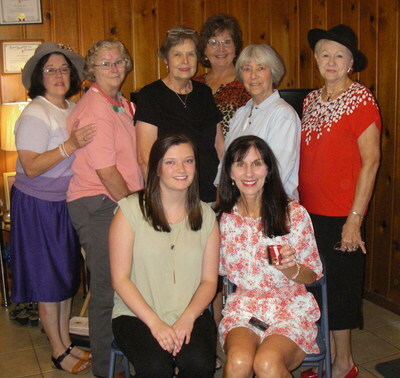 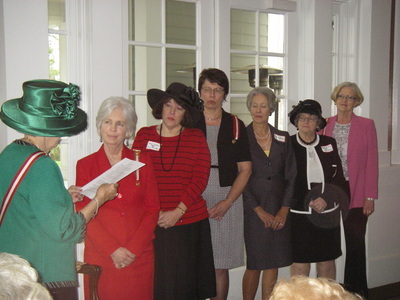 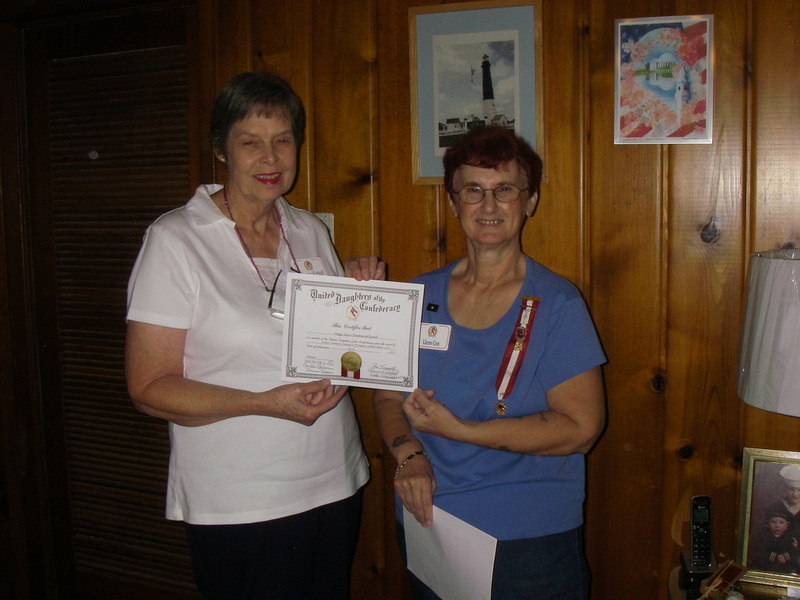 New Member Certificates Presented to Betty Holmes, Mary Vandever, received by her mother Leigh Ann Byrd; Leona McIntyre. 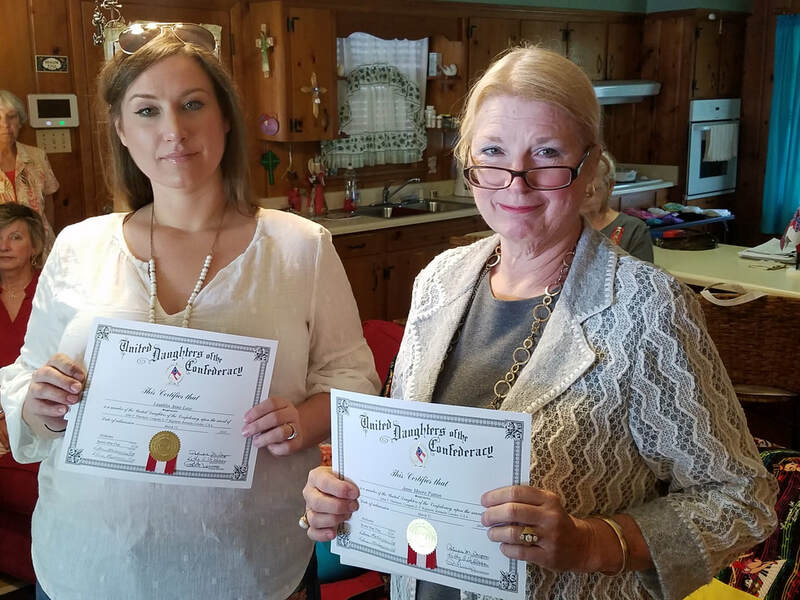 Supplemental Certificates presented to Sandie Ziglar and Leigh Ann Byrd. 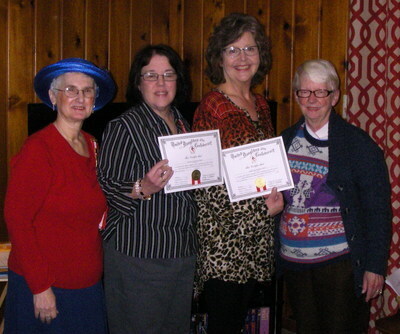 Supplementals presented to Llene Cox, Belinda Roberts and Peggy Kettell by Ann Biggs, Assistant Registrar. 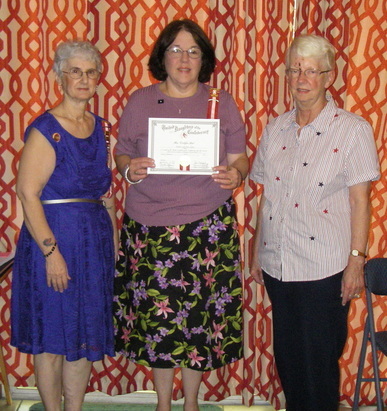 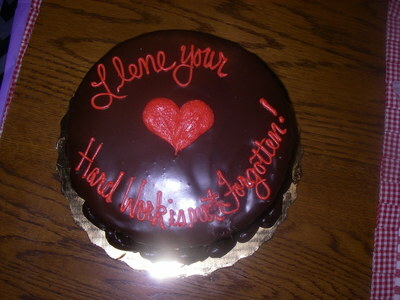 Cake presented to Llene by the Chapter. 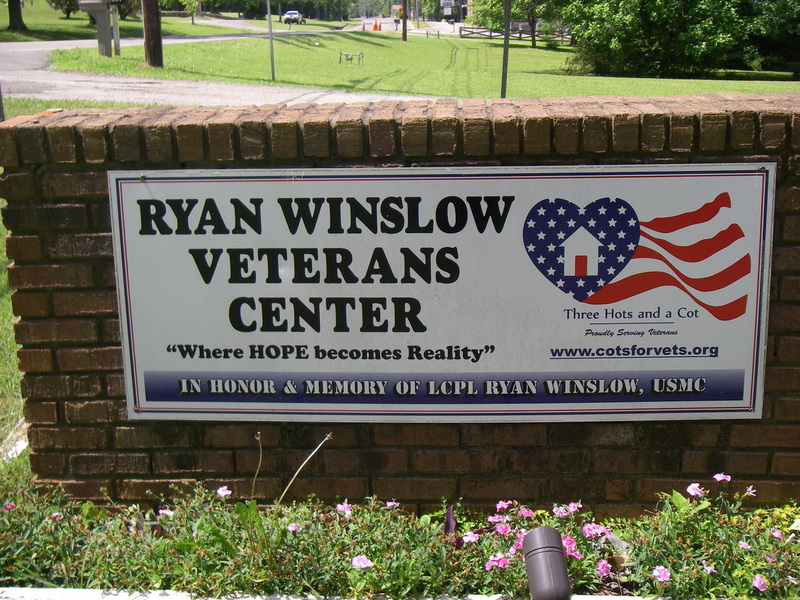 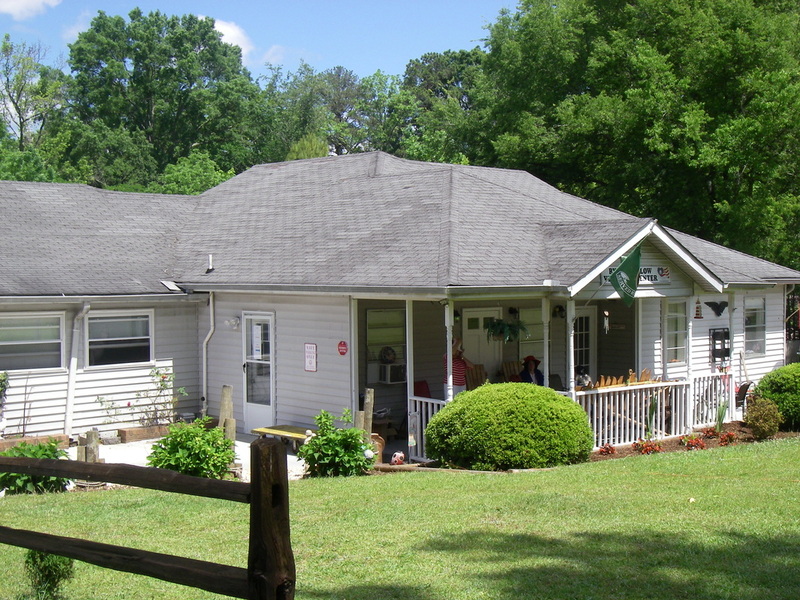 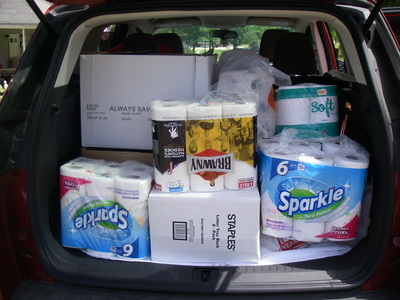 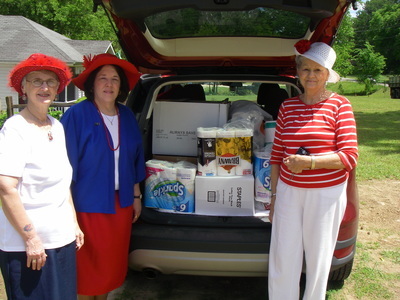 May 13 visit and delivery of collected items to Three Hots and a Cot in Birmingham. Terry Bailey presented a program on Camp Life During the War. Each soldier brought their own unique qualities and talents to camp life. They all had to share a life sometimes the entire time of war. 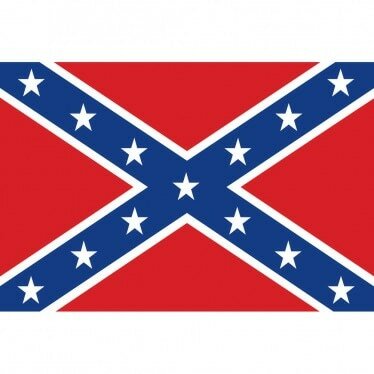 What a unique heritage that we all share. 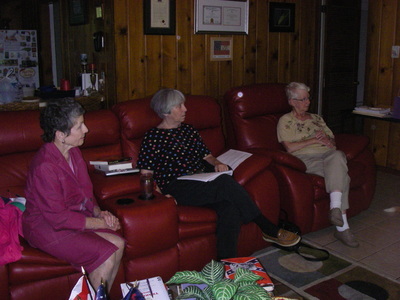 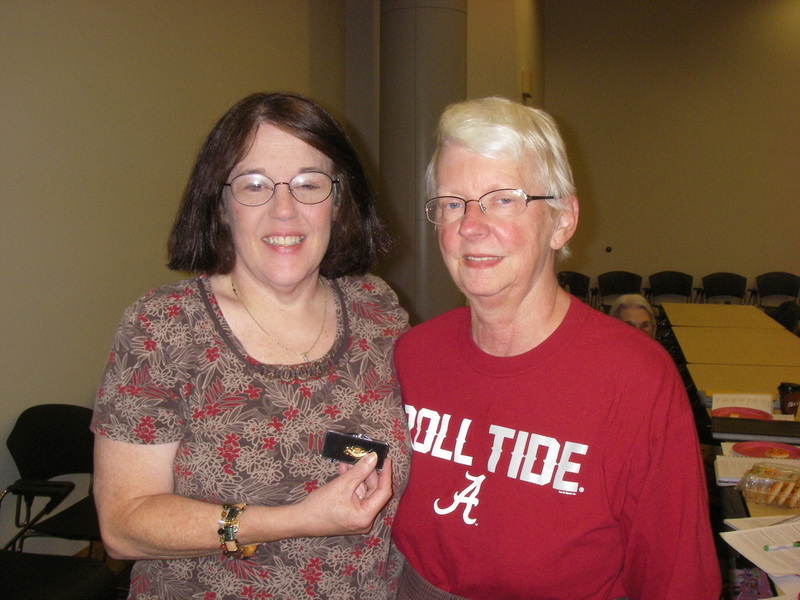 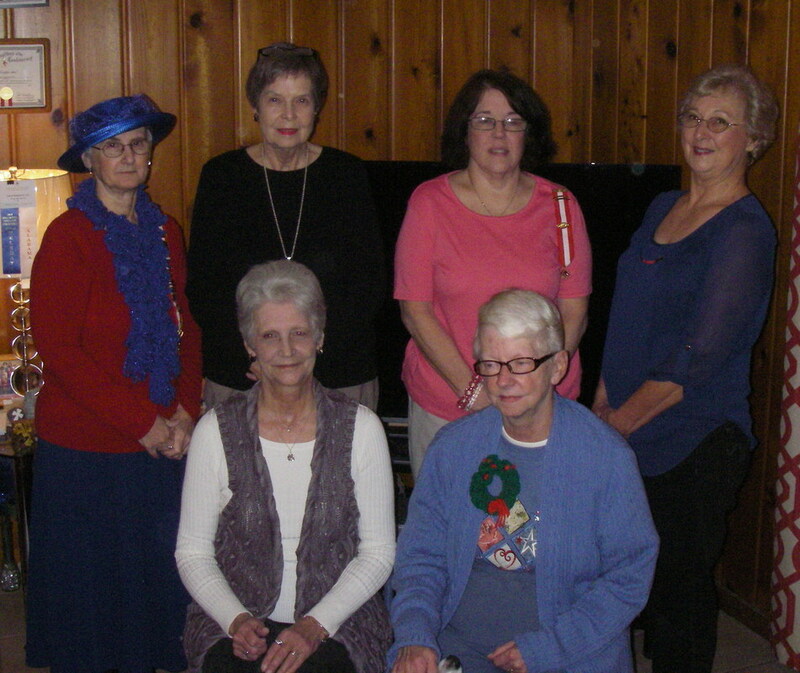 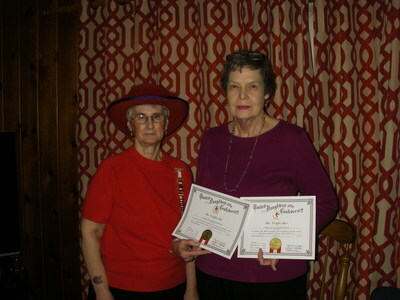 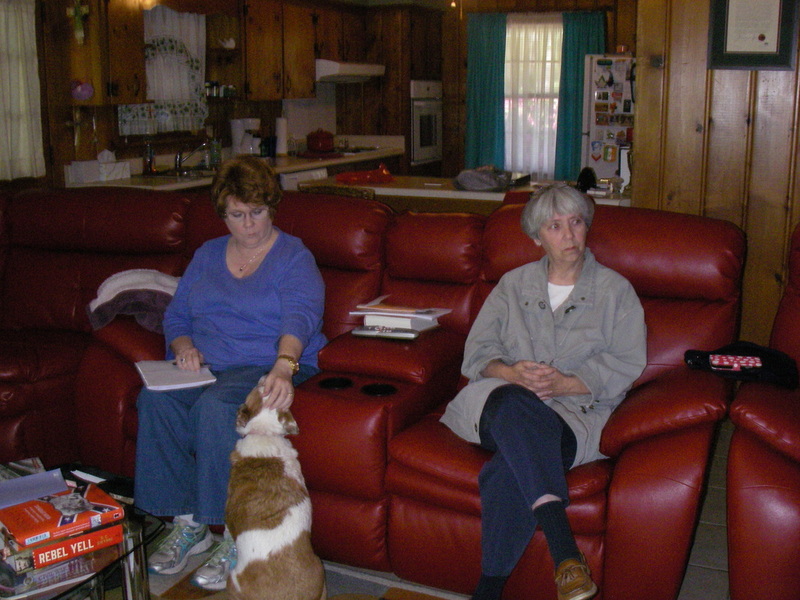 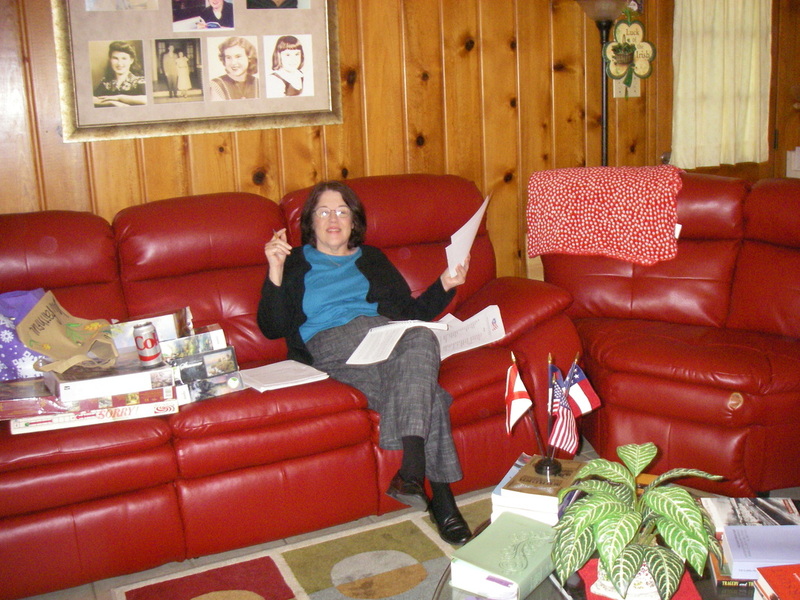 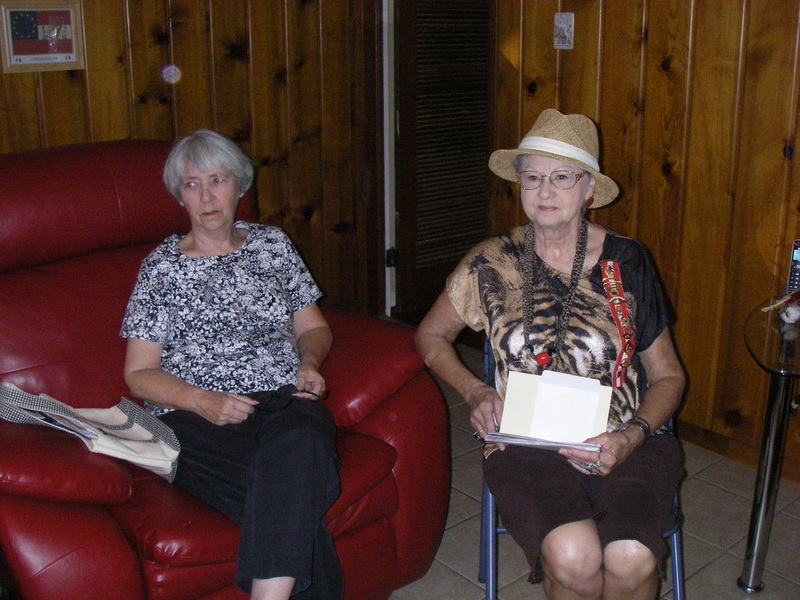 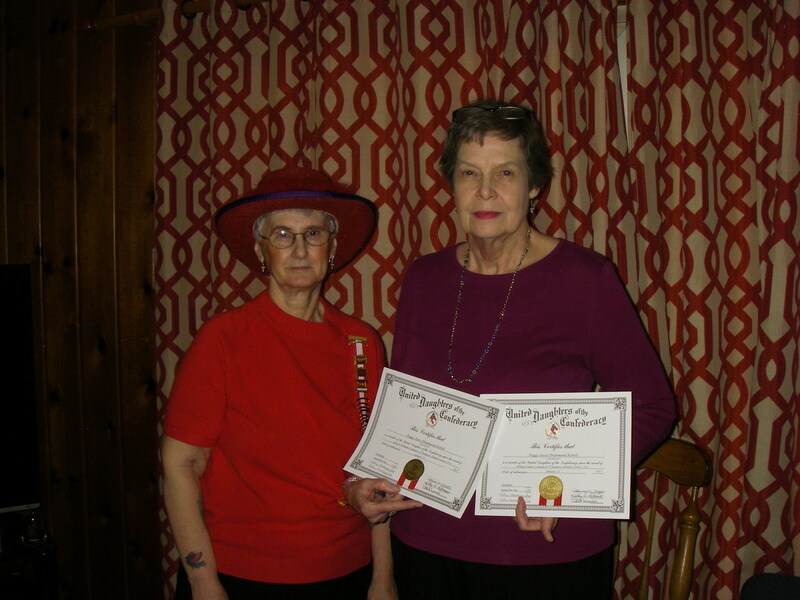 ﻿Llene and Peggy were presented with supplementals at the March 26 meeting. 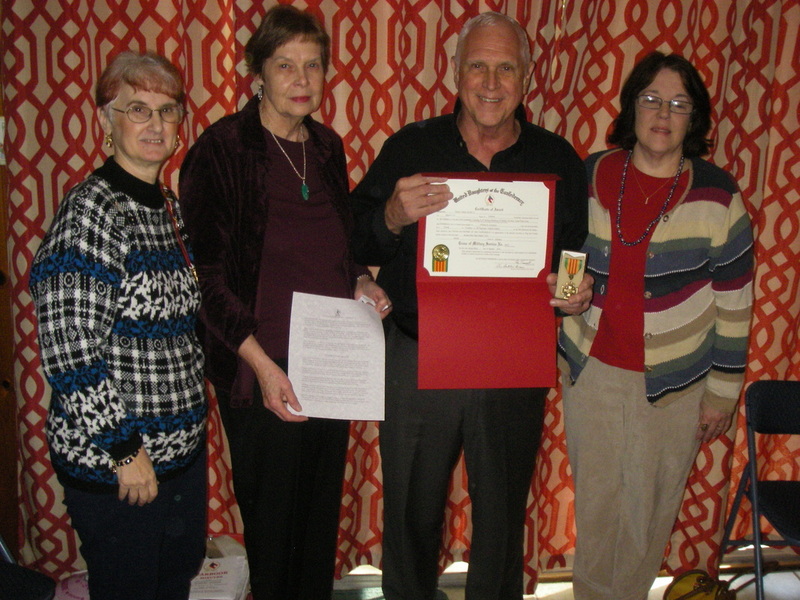 Cross of Military Service for Vietnam Conflict presented to Charles Kettell. 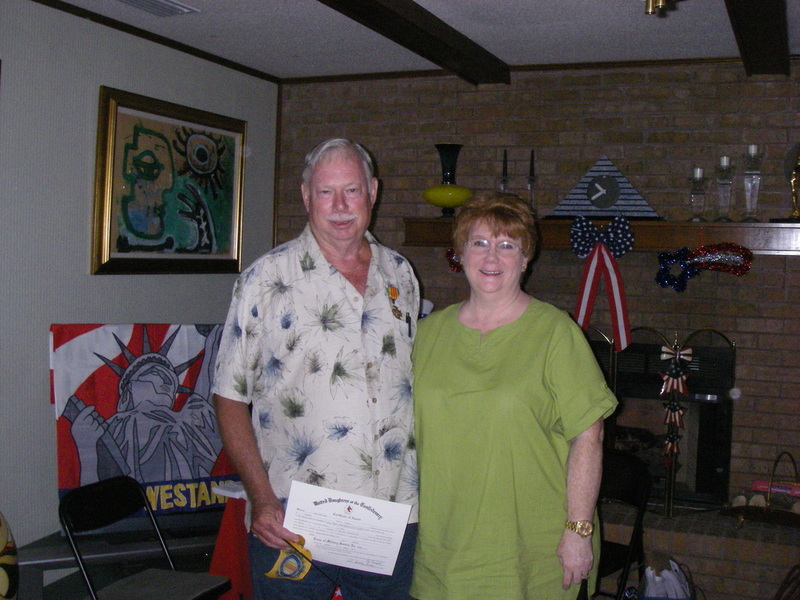 Cross of Military Service for Vietnam Conflict presented to Delloyce Beasley for her husband, Horace Beasley. 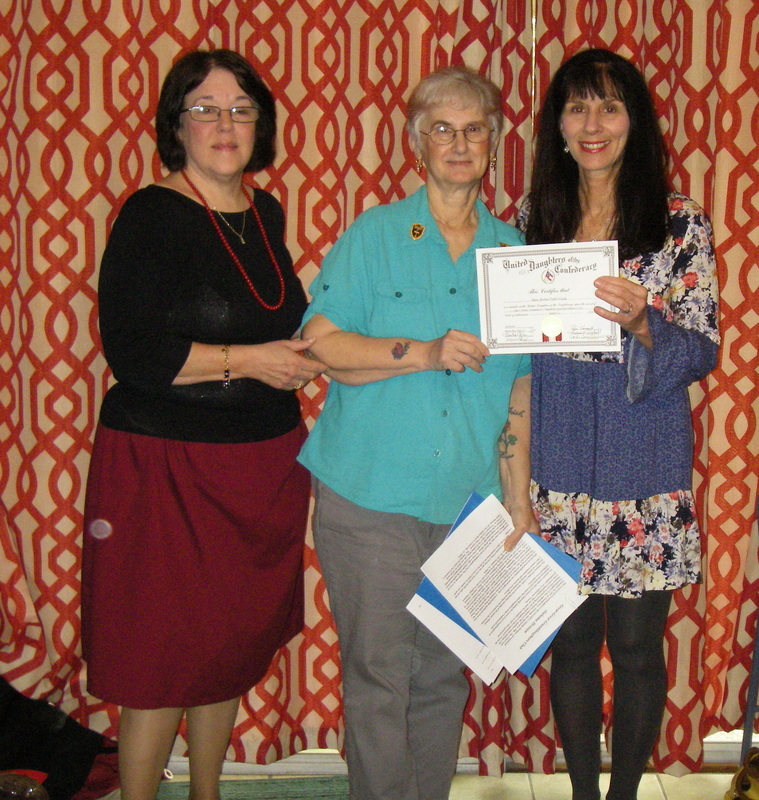 Llene, Assistant Registrar, presented to Peggy Kettell her Membership Certificate on her ancestor, David Thomas Drummond. 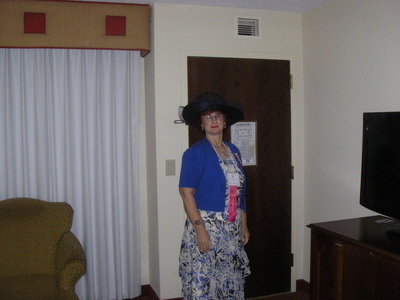 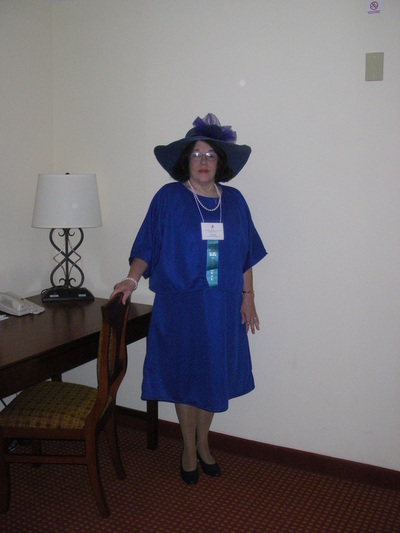 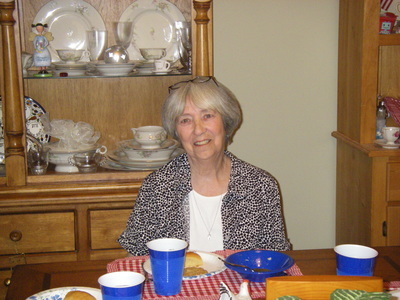 Our own beautiful Southern Belle, Linda Boykin. Jim Ziglar for his service in the Vietnam Conflict. 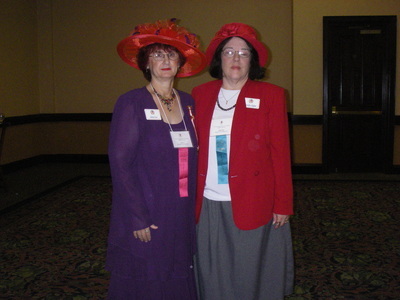 Llene and Corresponding Secretary Glendora James. 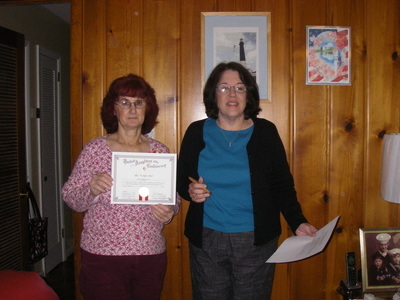 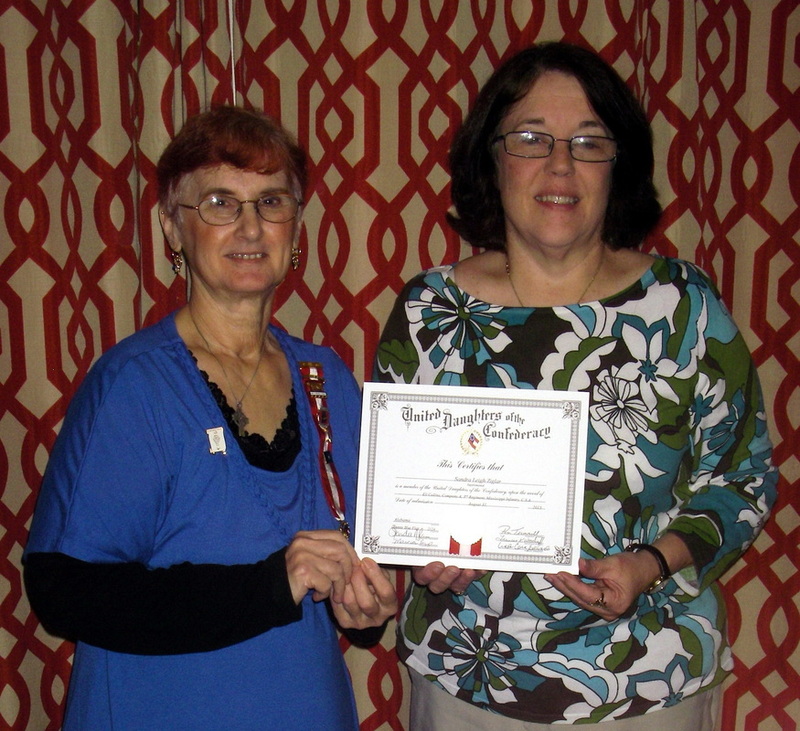 Llene was presented a Certificate of Appreciation from President Linda. Marshal Sandie and Page Llene all dressed for the President's Banquet. 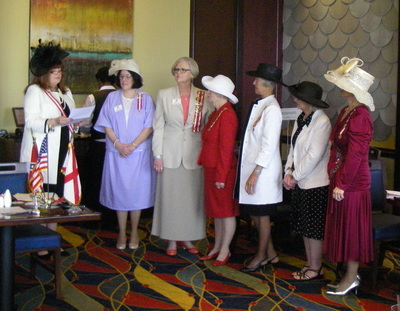 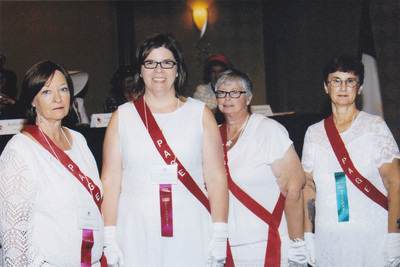 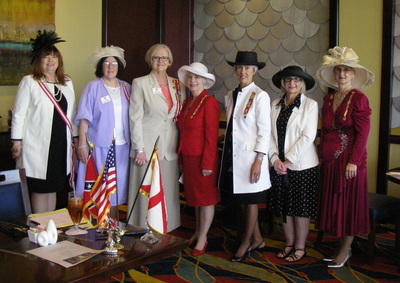 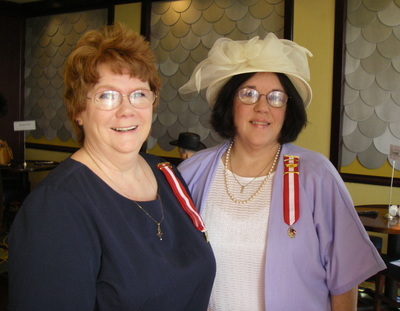 Sandie and Llene proudly served the Convention as a Marshal and Page. 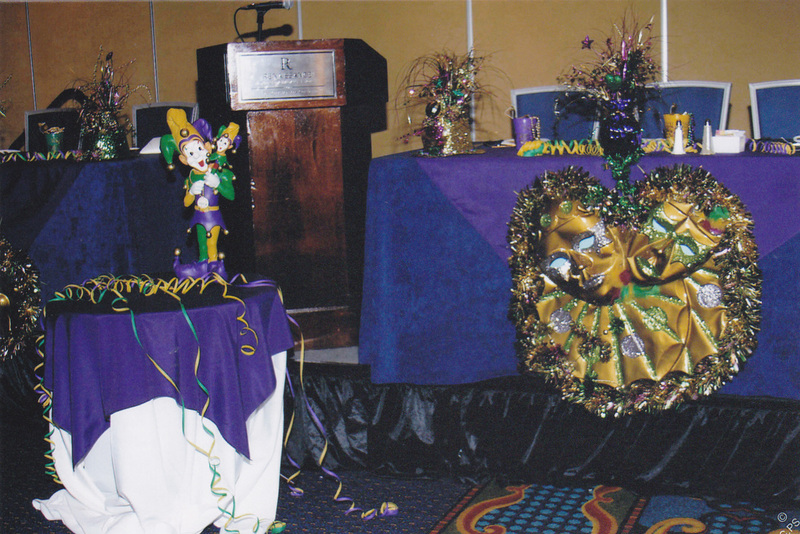 Our Own Mardi Gras Queen, Linda Boykin. 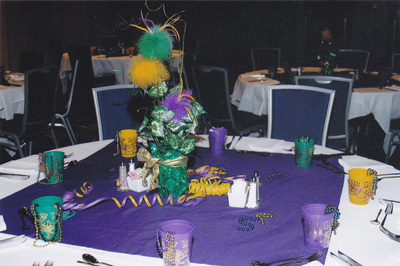 The tables and decorations are all set for the President's Banquet. 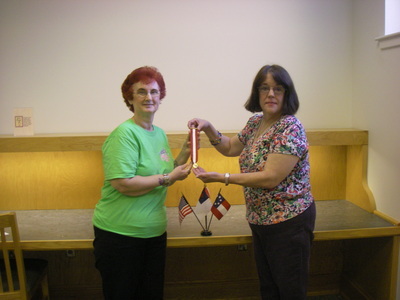 On Saturday, August 15 Chapter President, Sandie Ziglar and Llene Cox, Assistant Registrar, presented to Margaret Lynn Ellis her Membership Certificate on her ancestor James Lafatte Buckaloo. On Saturday, August 15 Linda Boykin and Llene Cox presented to David Olin Coats a Vietnam Conflict Cross of Military Service Certificate and Lapel Pin. 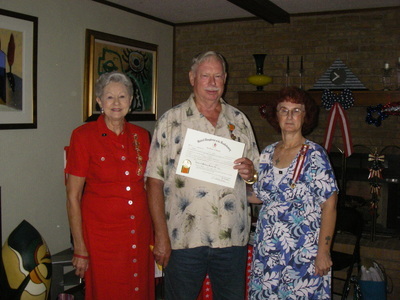 David is also pictured with his wife Margie, Chapter Recording Secretary. Sandie presenting Llene with supplementals for Joseph Eaton Wheat and Henry Burton Cline. 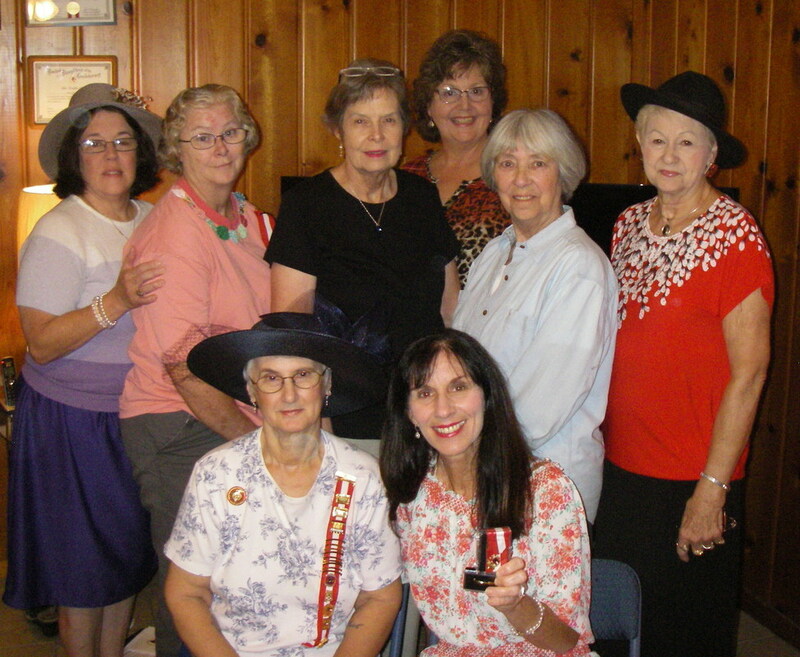 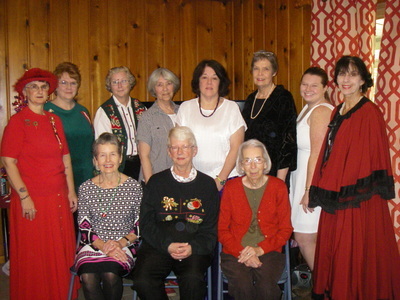 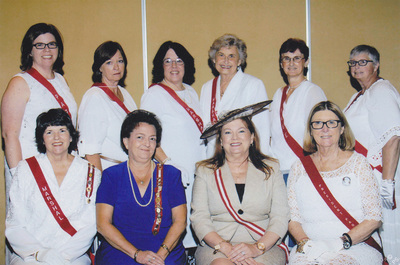 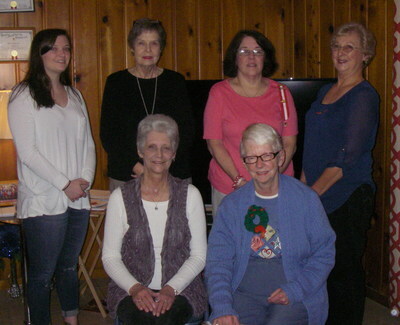 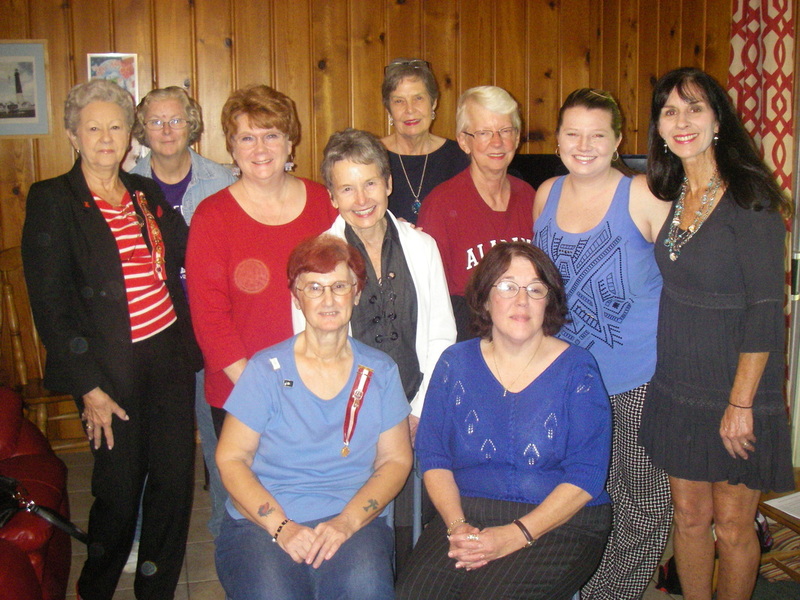 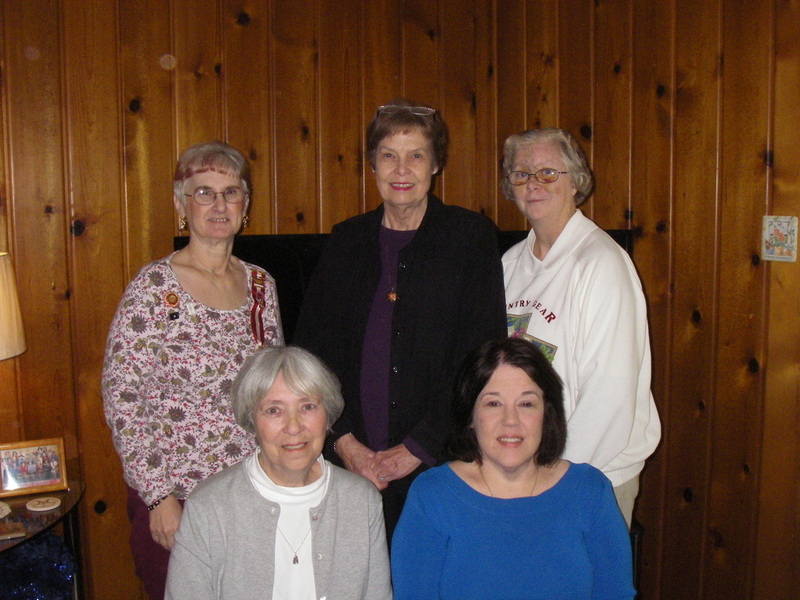 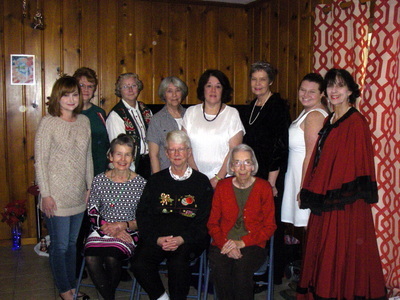 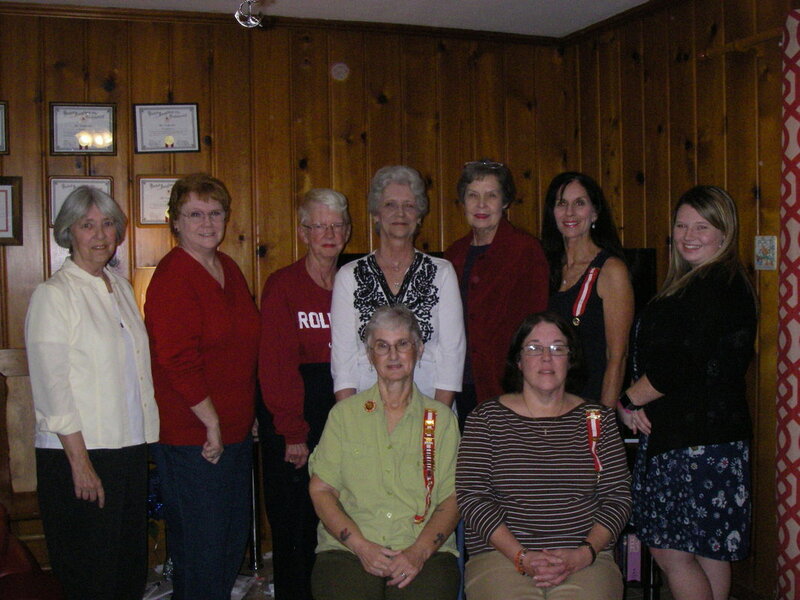 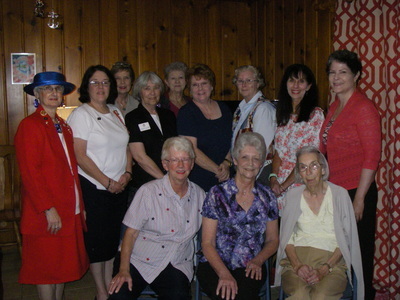 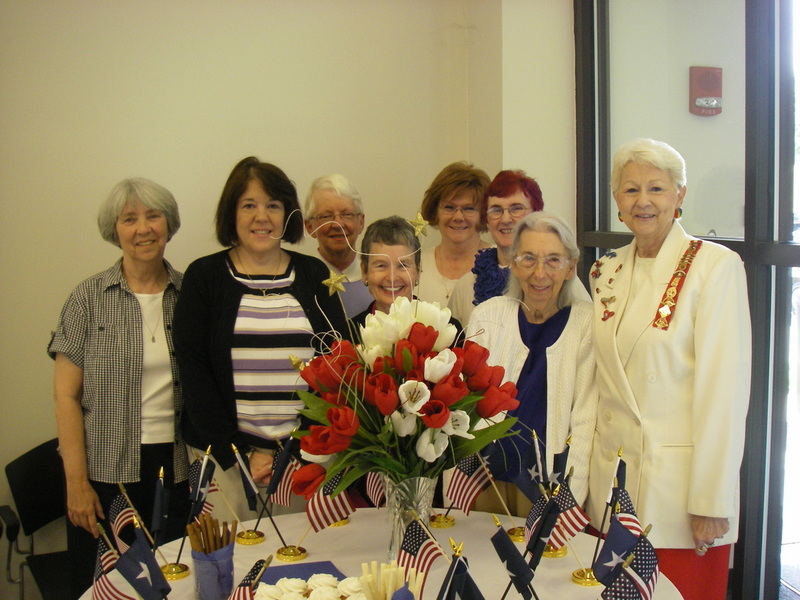 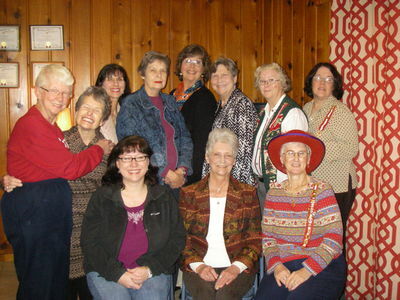 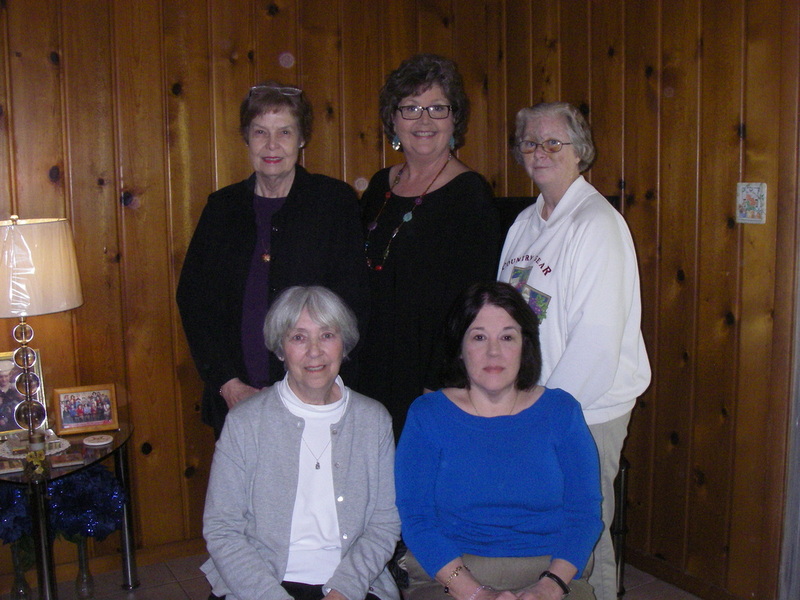 Chapter officers -- Ann Biggs-Registrar; Llene Cox-Assistant Registrar, Historian, Recorder; Linda Boykin-Chaplain; Sandie Ziglar-President. 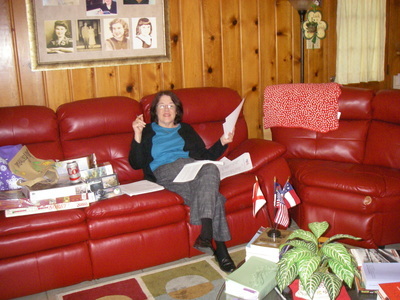 Secretary not present. 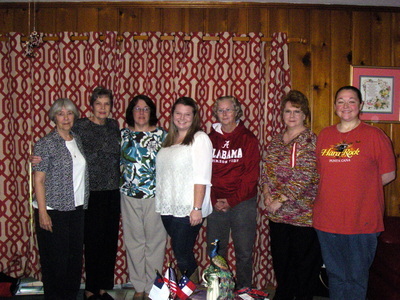 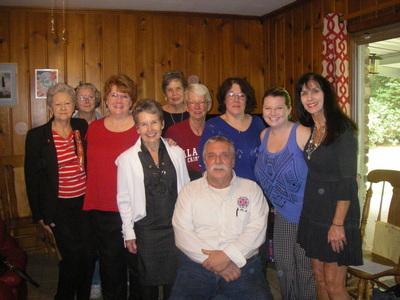 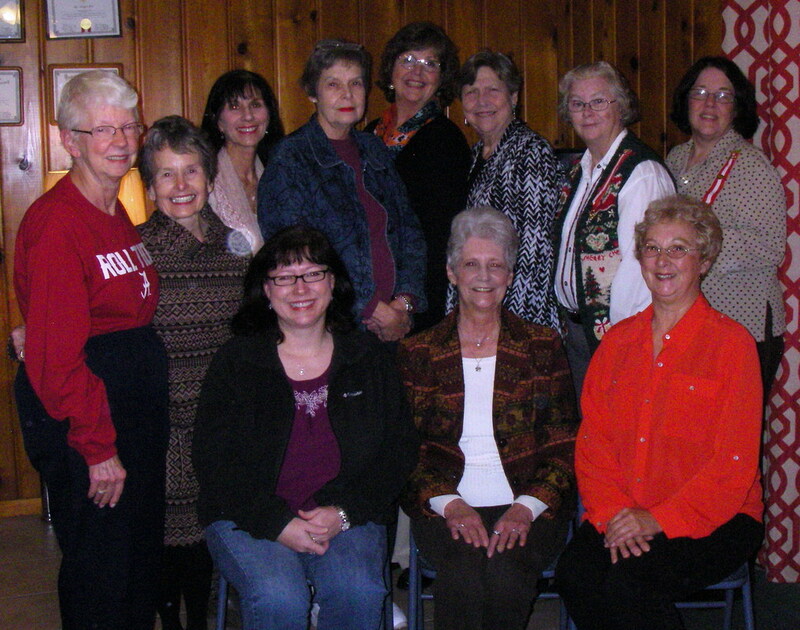 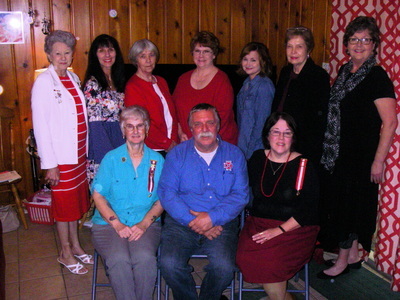 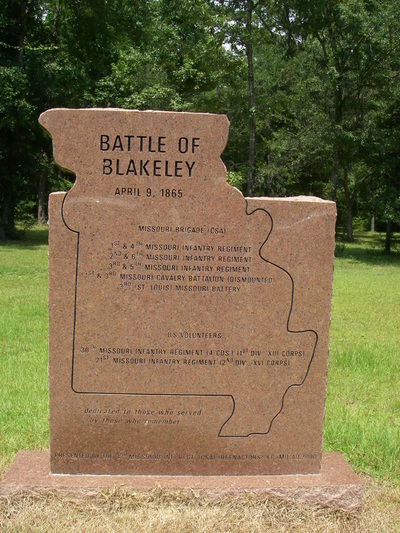 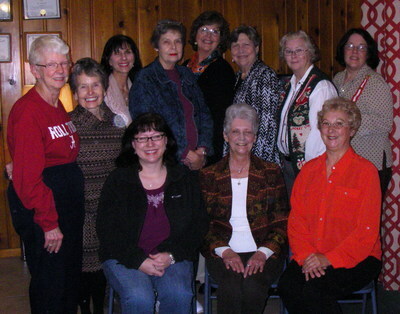 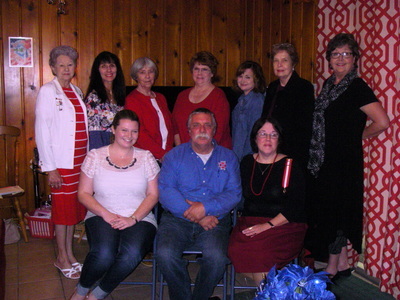 Chapter Meeting April 25. 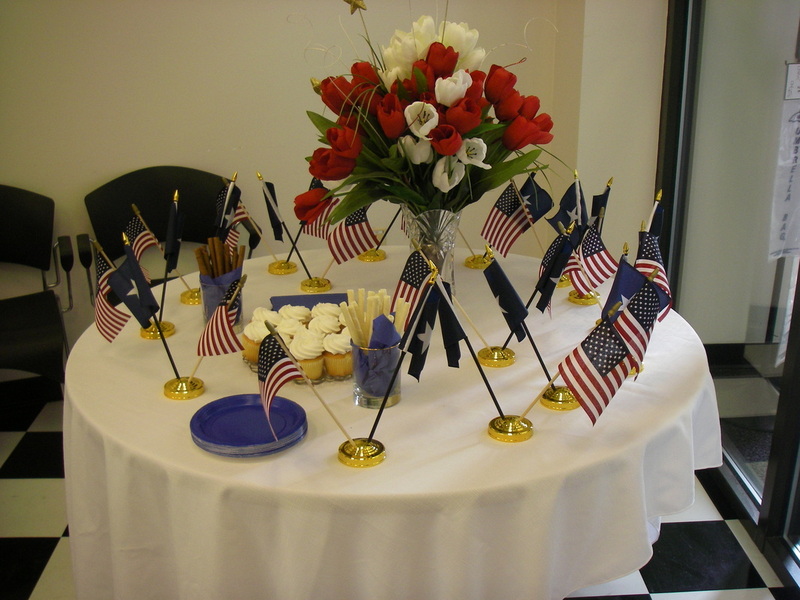 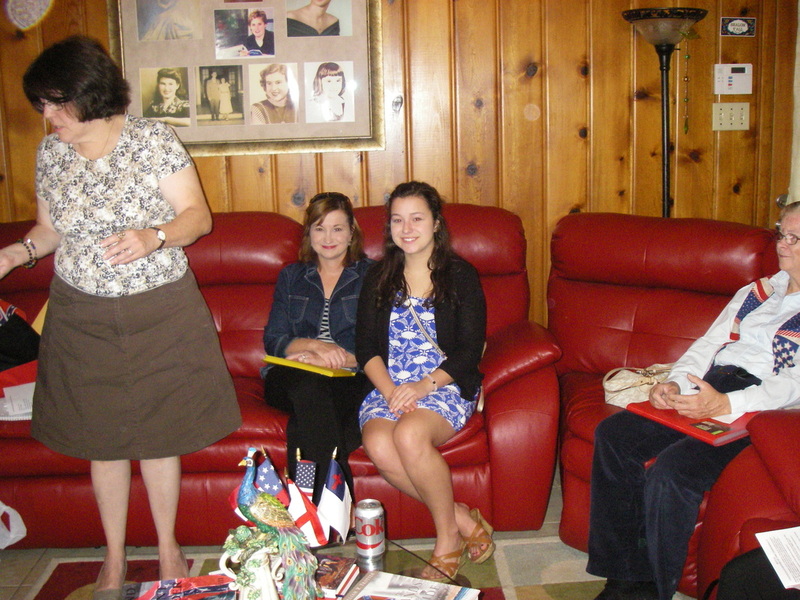 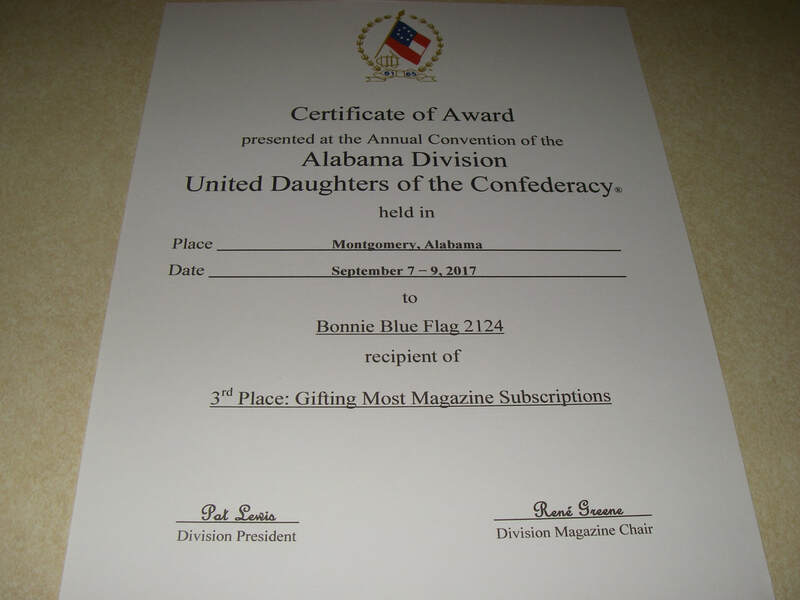 After the meeting, we all celebrated Bonnie Blue Flag's 73rd birthday. 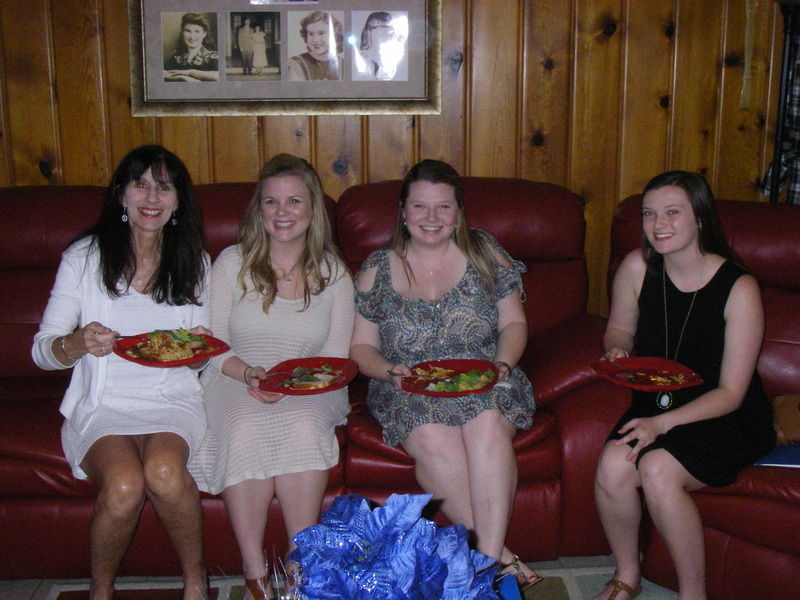 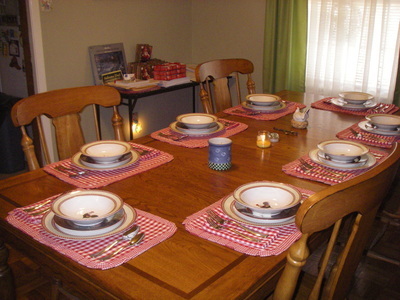 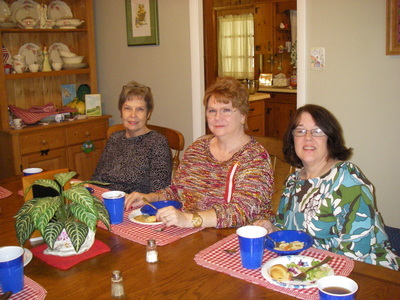 We all enjoyed lots of good food. Chapter members were all presented with birthday gifts. 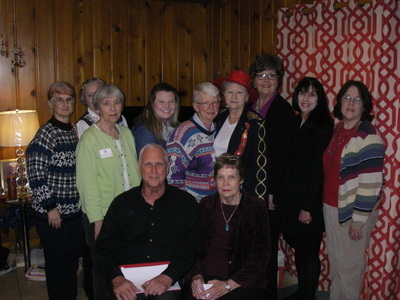 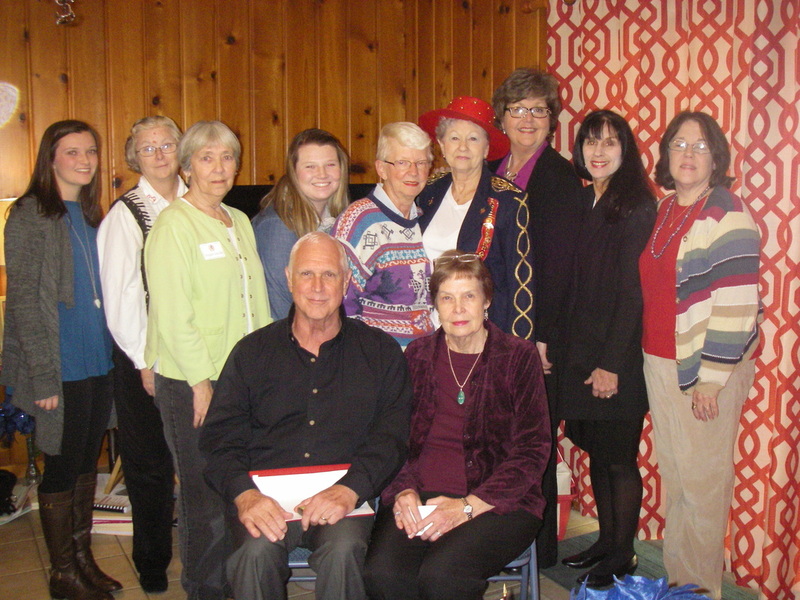 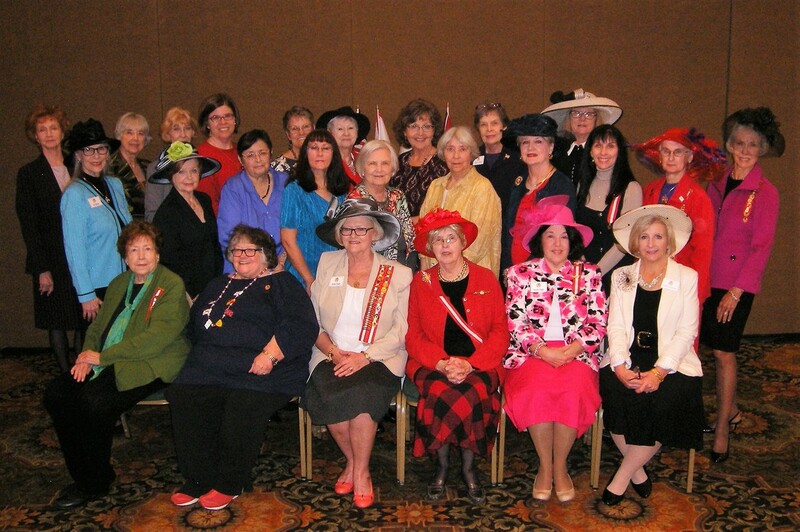 Chapter Meeting March 28. 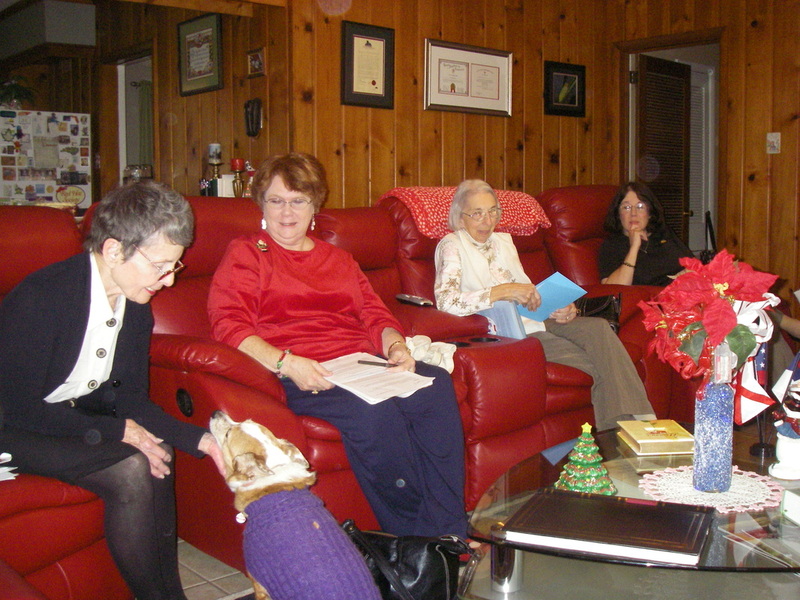 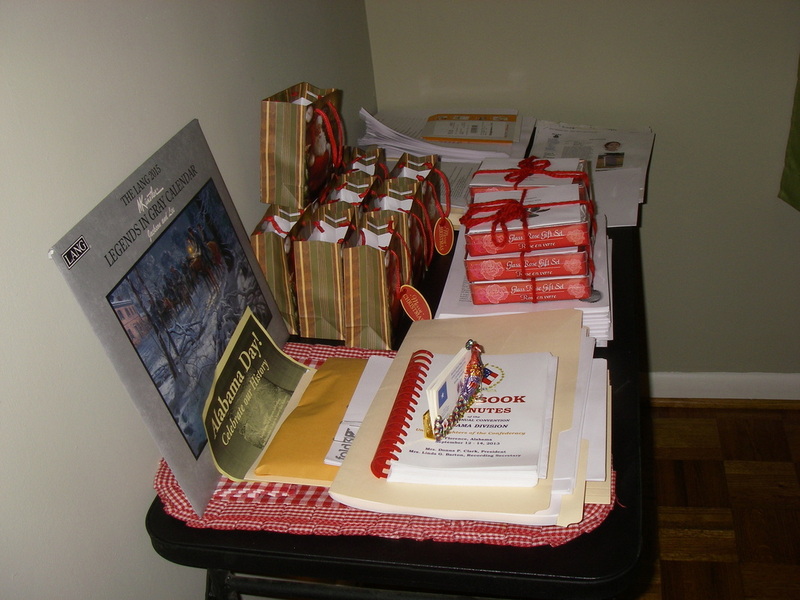 We are all busy working on our family histories, new member applications and chapter projects. 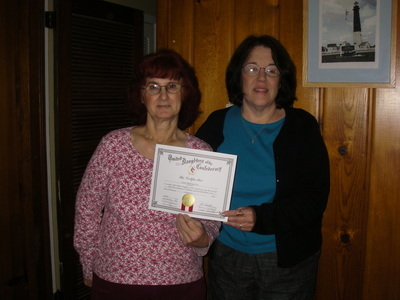 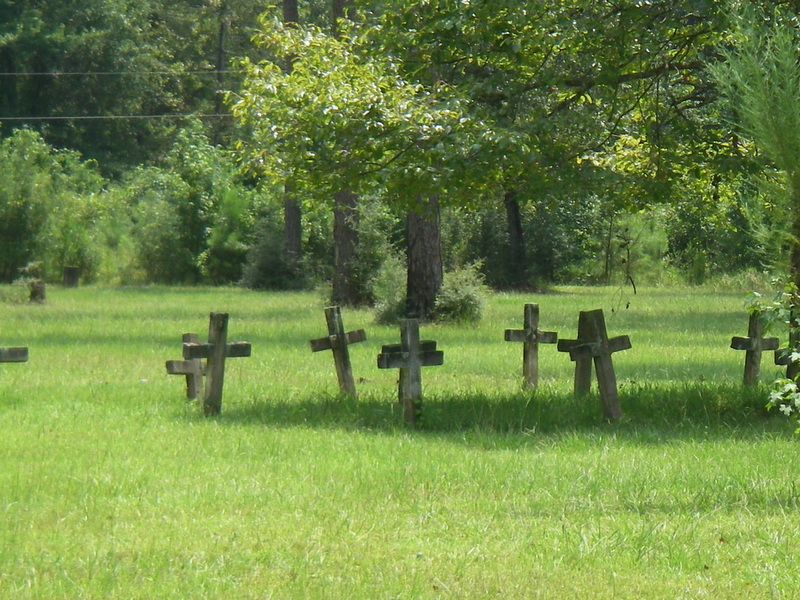 Sandie also presented Llene with a supplemental application for her ancestor James Cline. 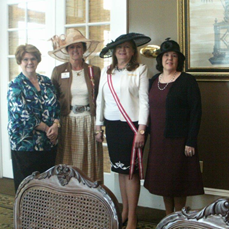 Mobile Bay District Meeting, Steelwood Country Club, March 27. 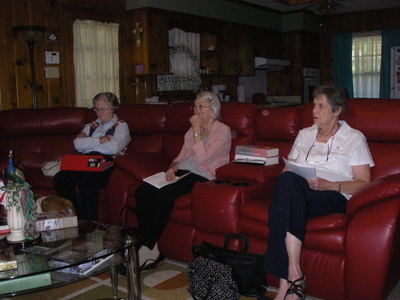 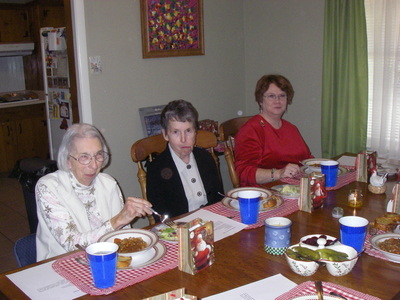 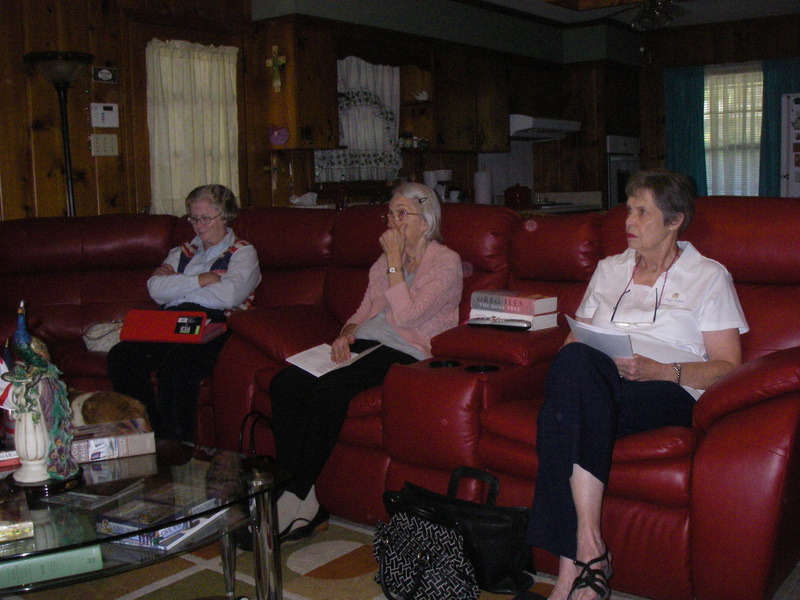 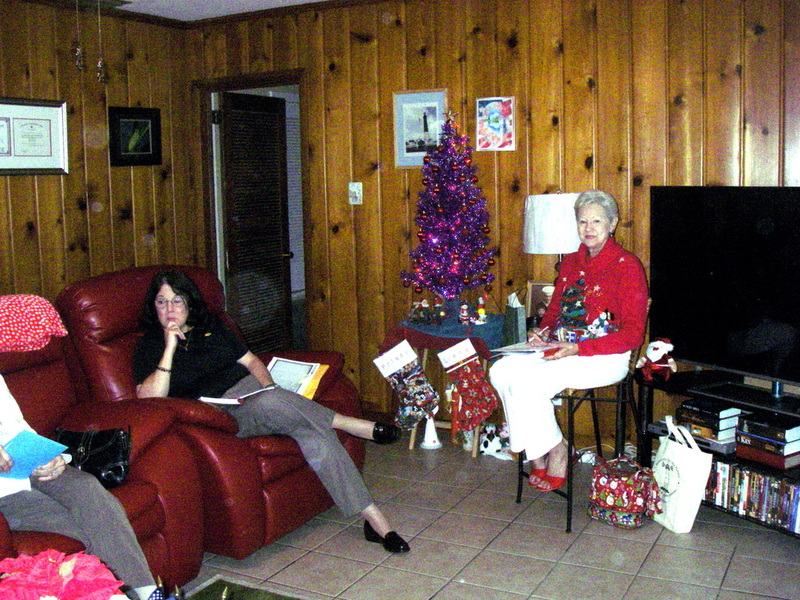 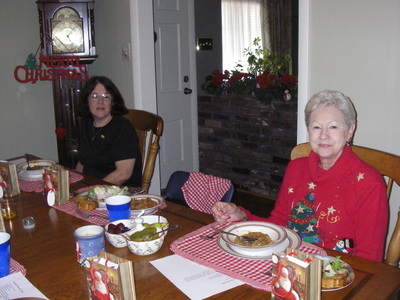 Those attending were: Sandie Ziglar and Margie Coats. 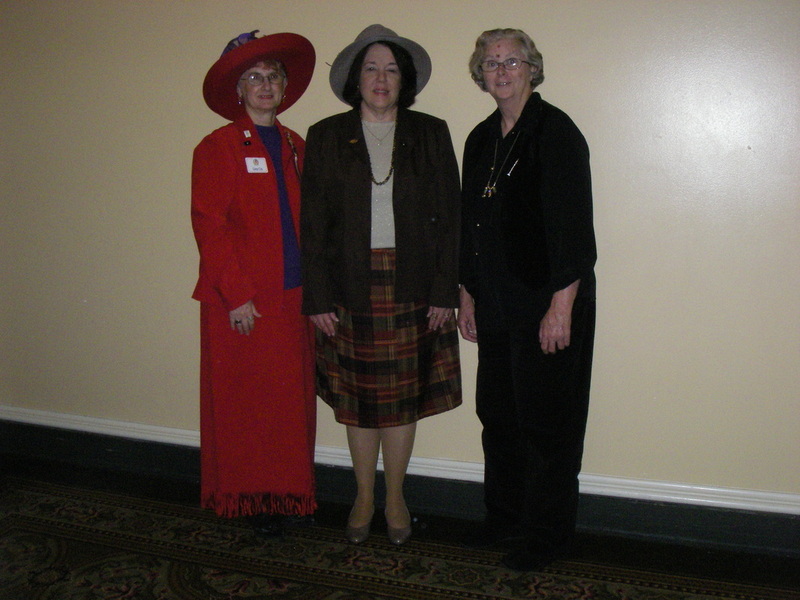 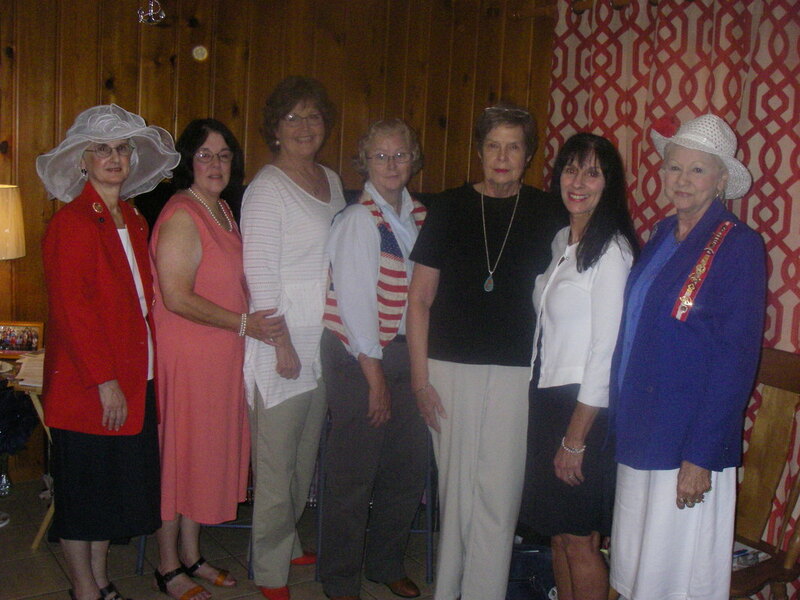 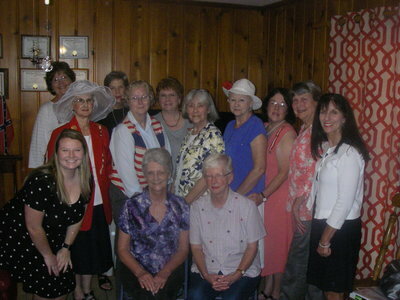 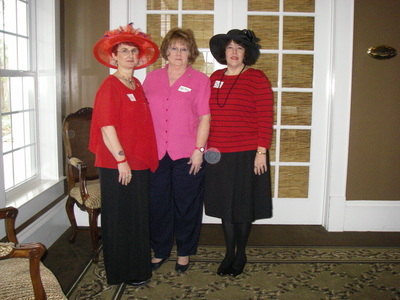 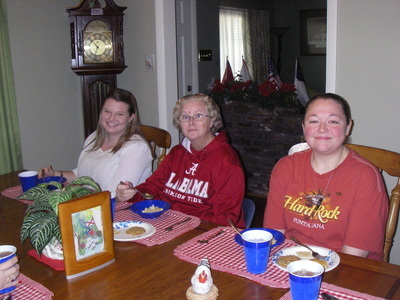 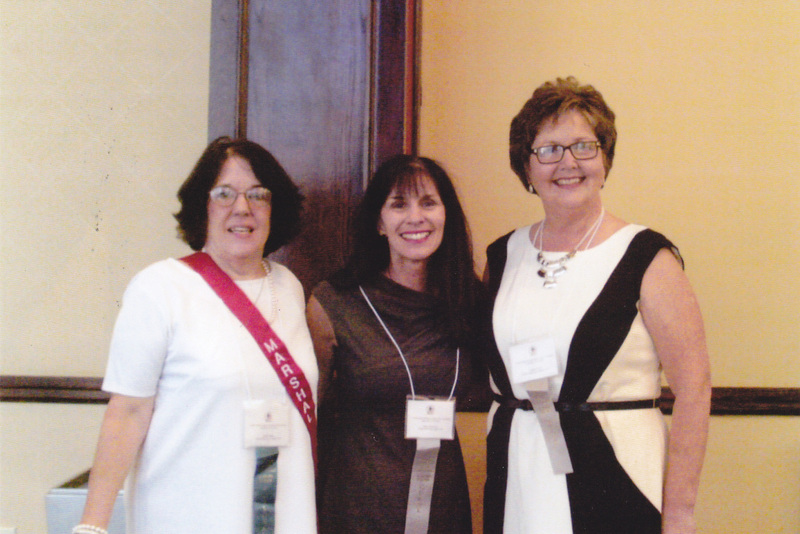 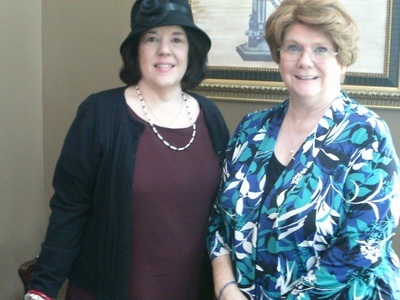 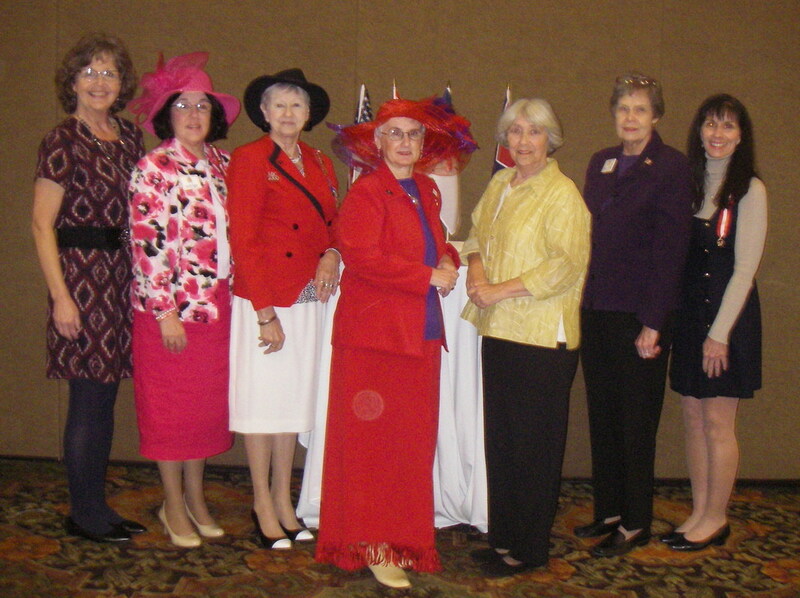 Also pictured are Laura Womak Rowell, Division Recorder and Linda Corn Edwards, Division President. 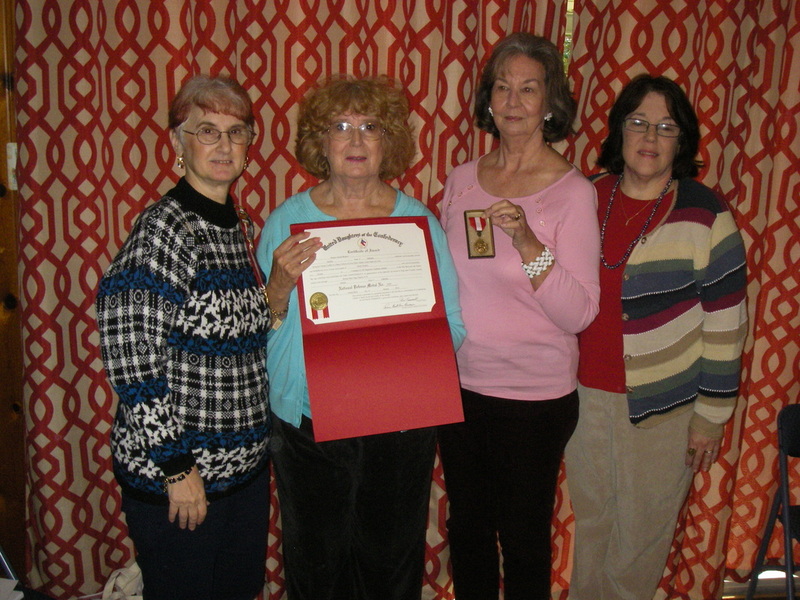 Chapter President Sandie Ziglar presenting to Llene Cox supplementals for her ancestors, Thomas James Adams, Pharoh G Adams and Elisha M Bobo. 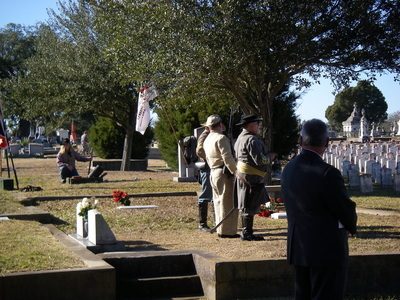 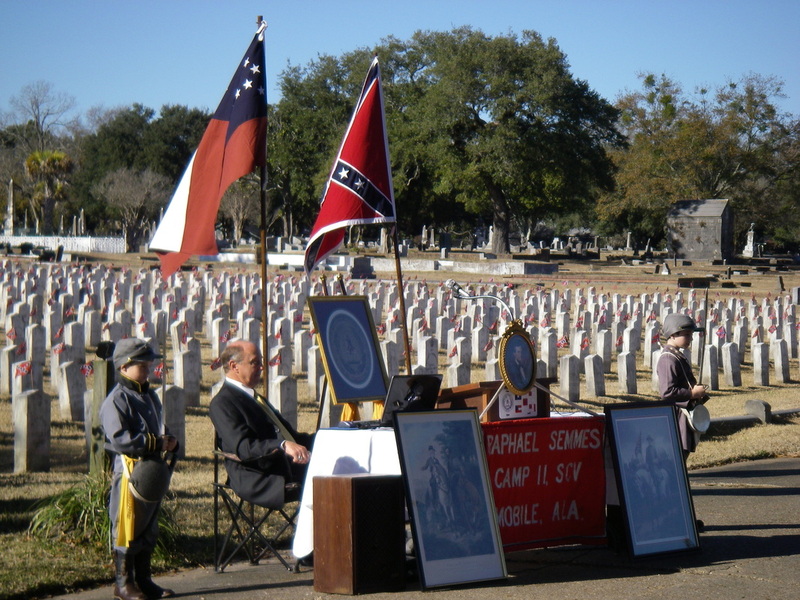 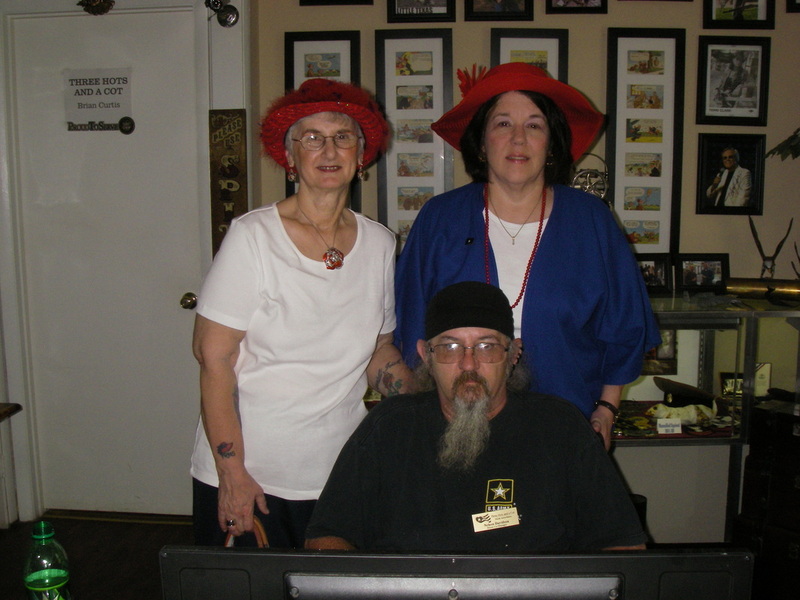 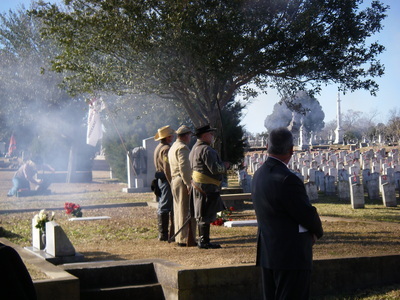 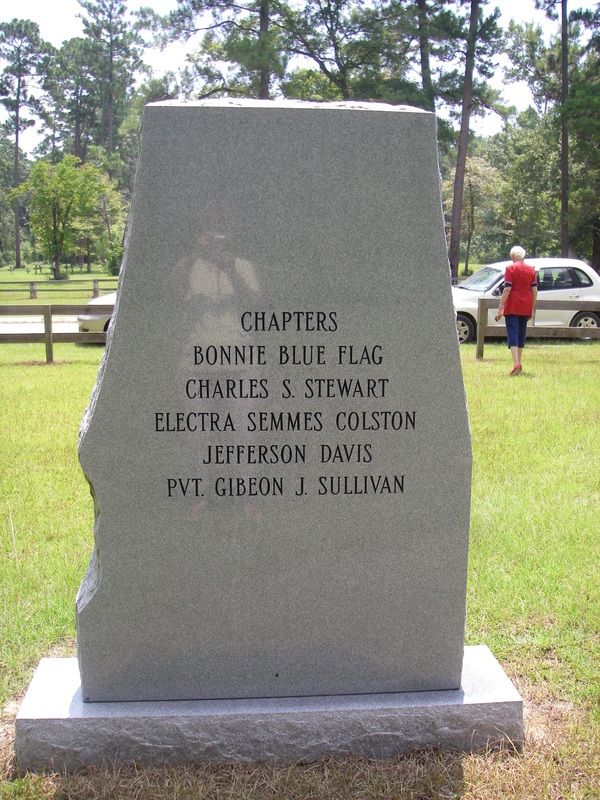 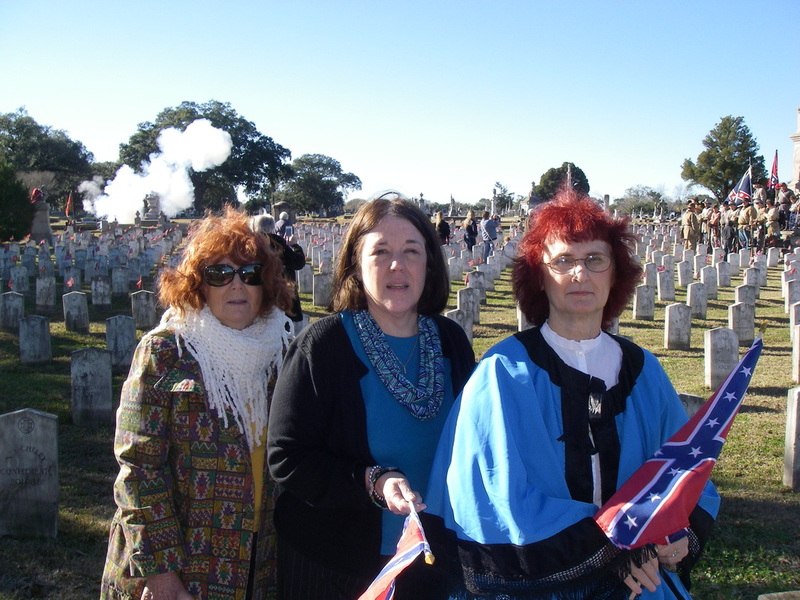 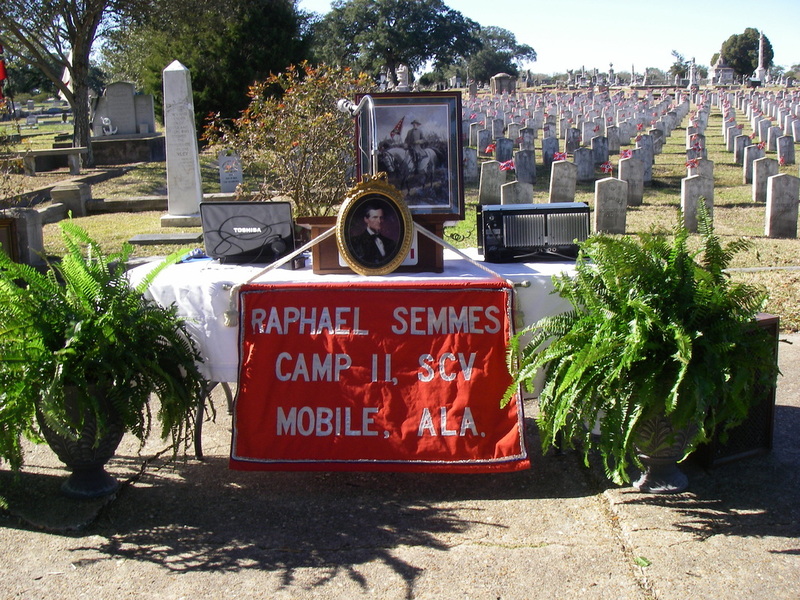 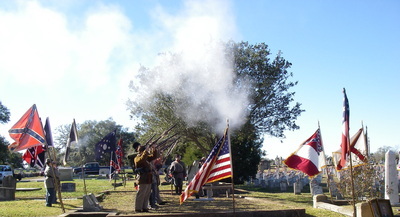 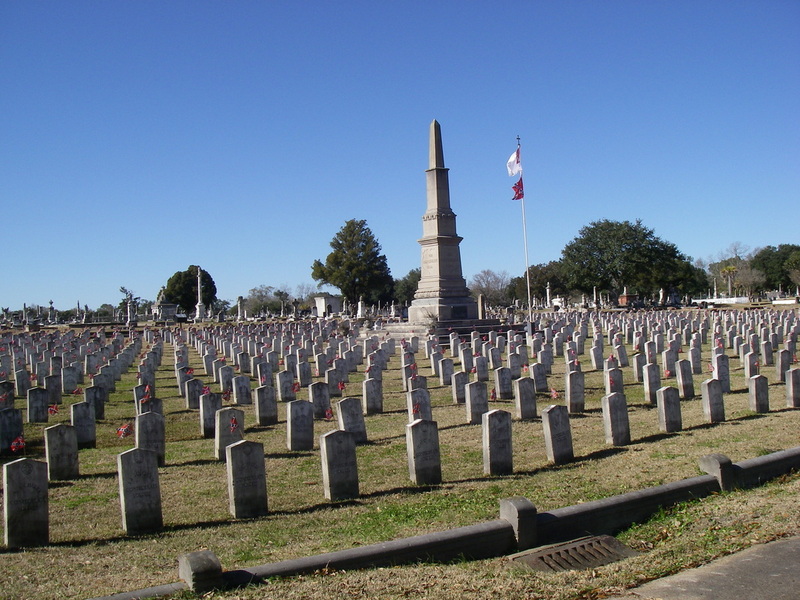 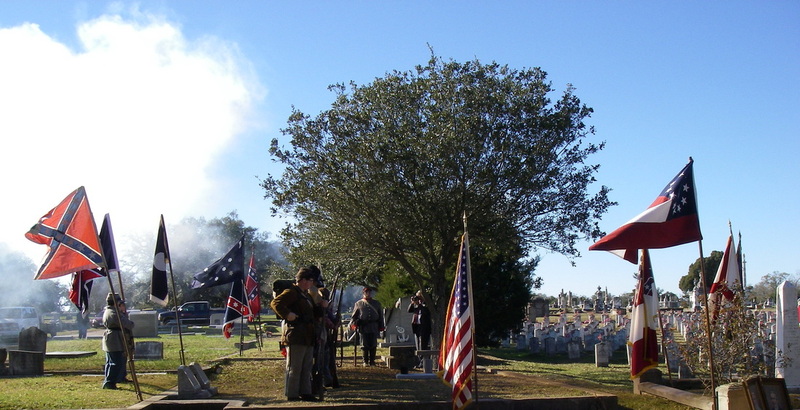 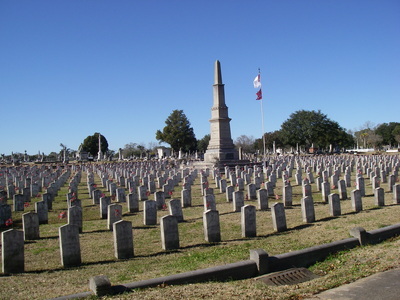 Delloyce, Sandie, and Llene attended a Robert E Lee Memorial, Sunday, January 18 at Magnolia Cemetery. Delloyce Beasley, Margie Coats, Chapter President Sandie Ziglar and Llene Cox attended Winter Board on Saturday, January 17 in Montgomery. 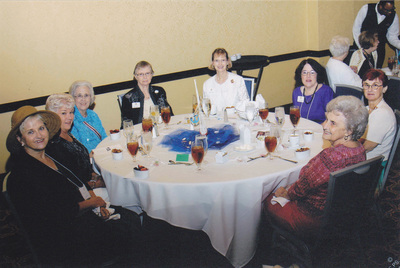 We all enjoyed the time we spent with our Sisters. 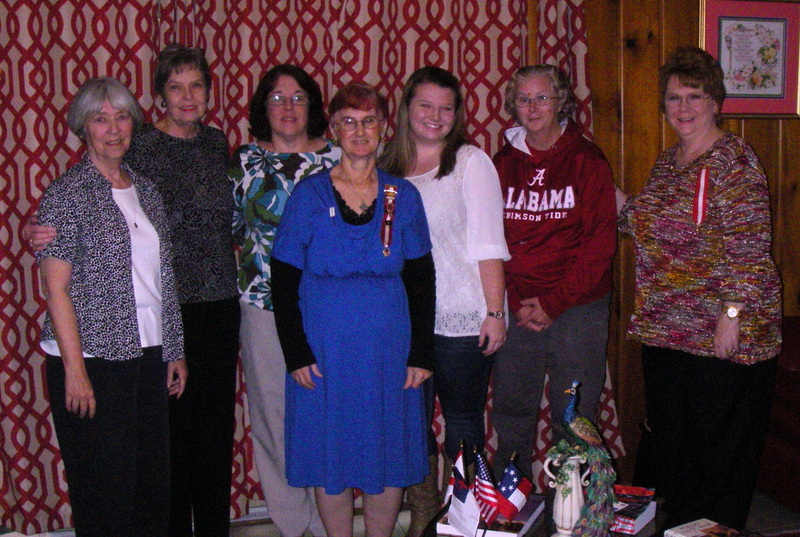 Our Division Officers gave us very important information that we all need to further our work in our home chapters. 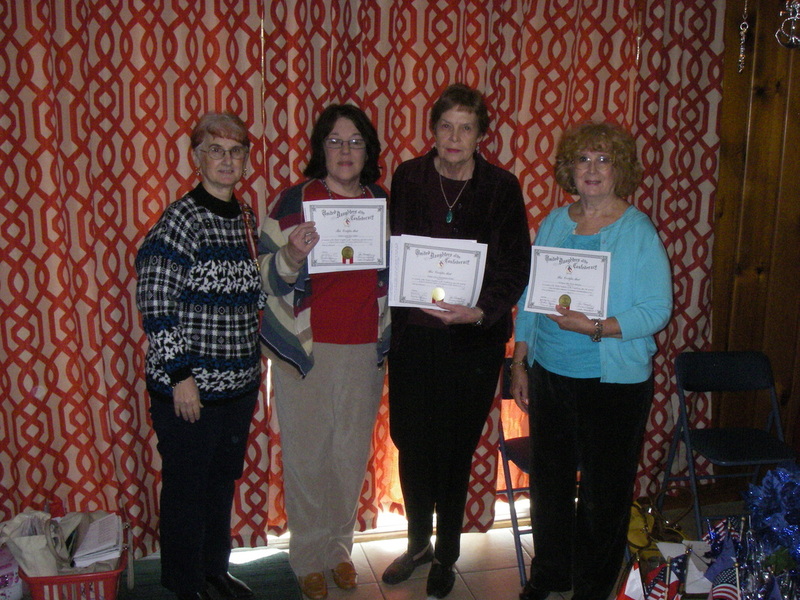 Three Hots and a Cot is our Chapter project. We will be collecting items for donation to vets who help homeless vets. 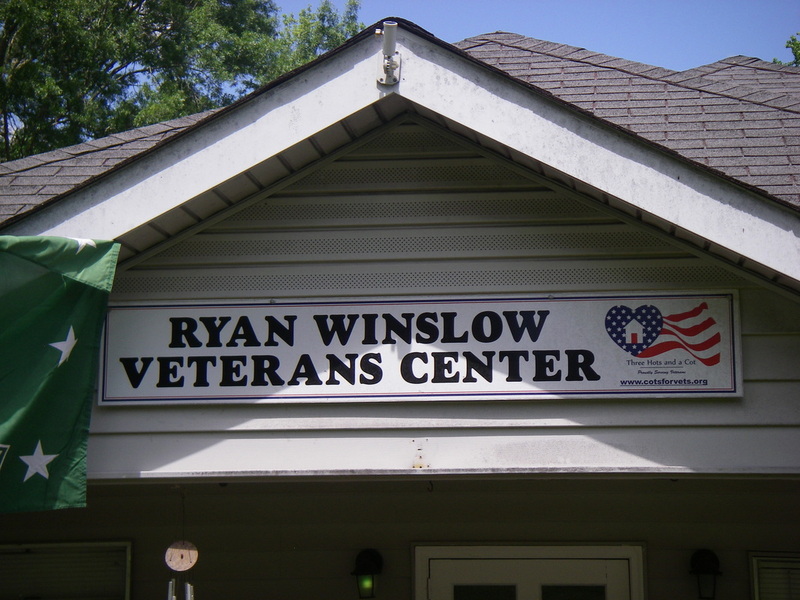 Our vets have spent a great part of their lives protecting this great country. 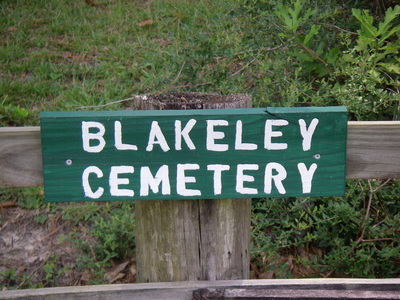 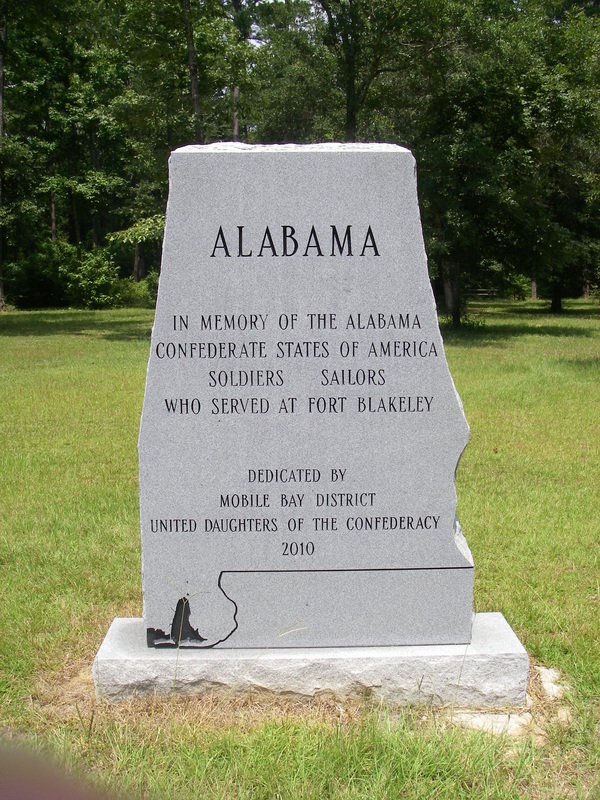 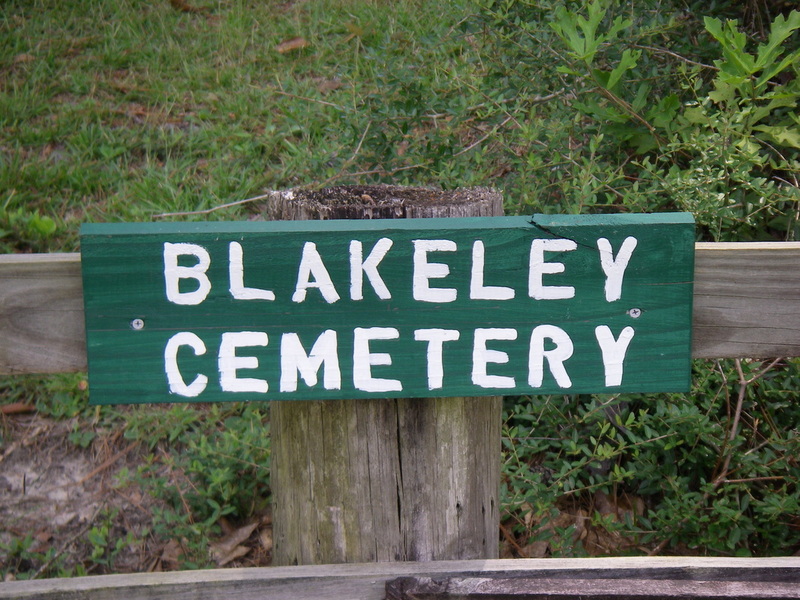 This is also a terrific way to honor our Confederate ancestors. 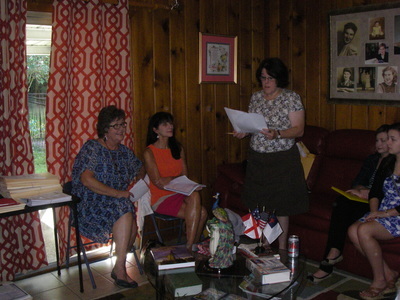 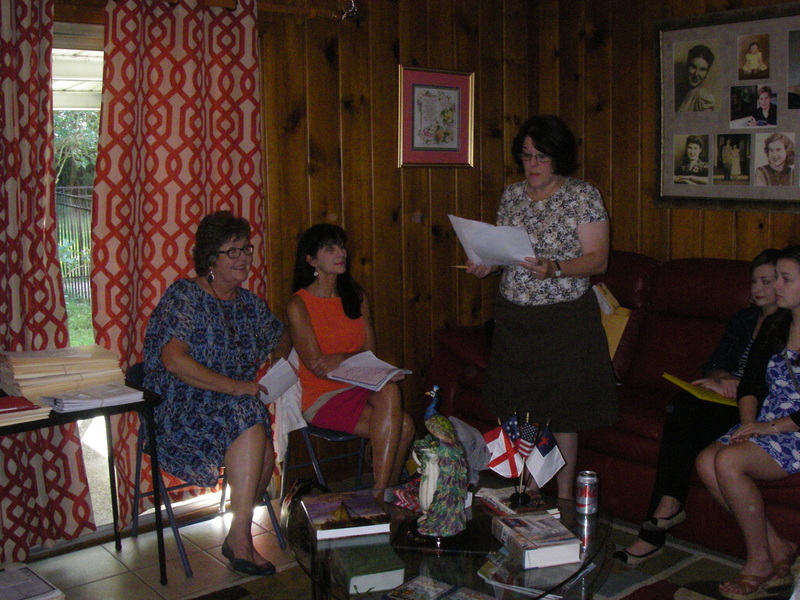 Bonnie Blue Flag attendees were Sandie Ziglar, Margie Coats and Llene Cox. 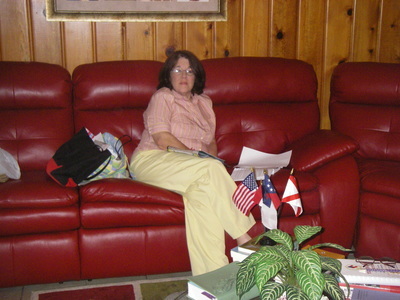 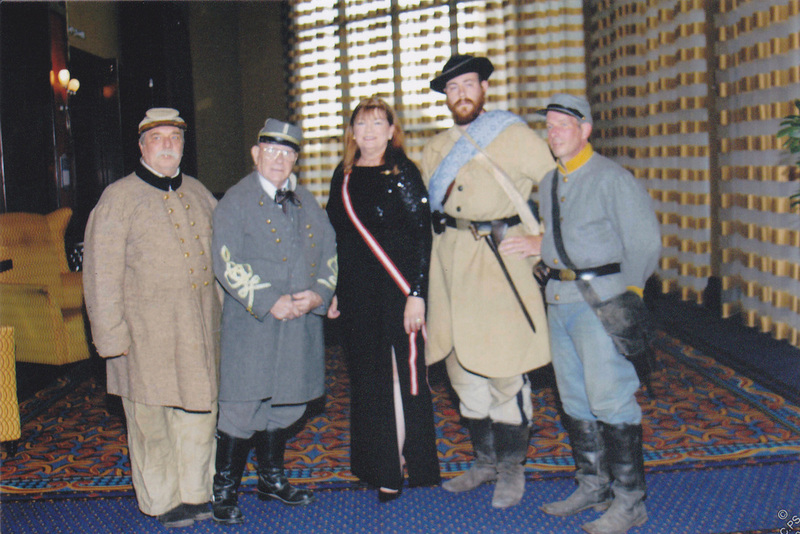 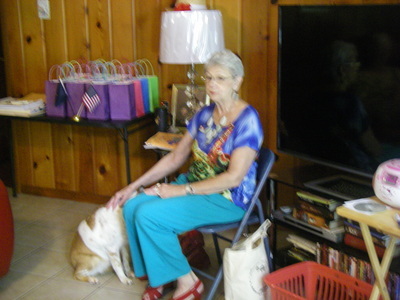 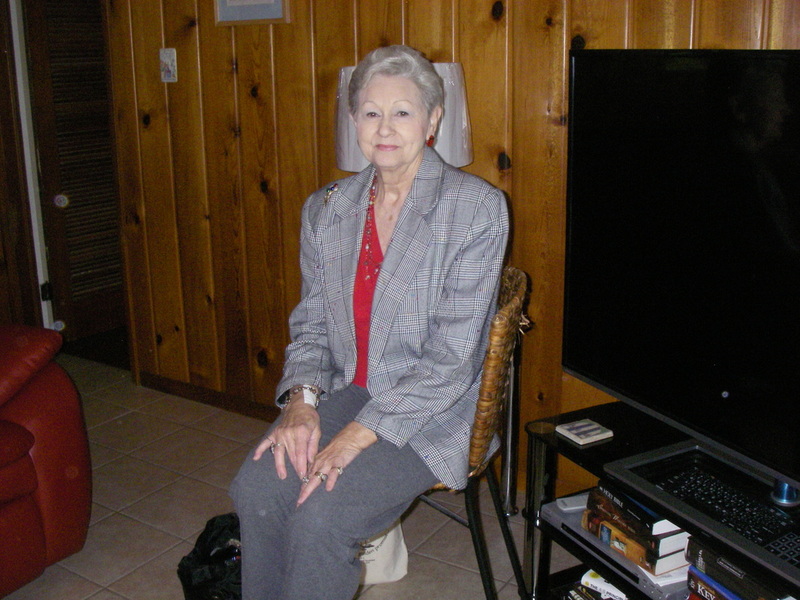 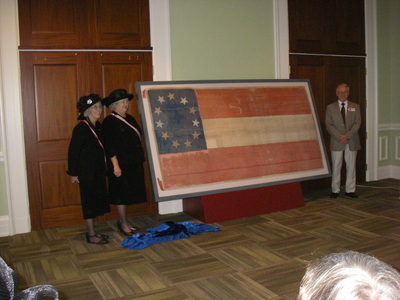 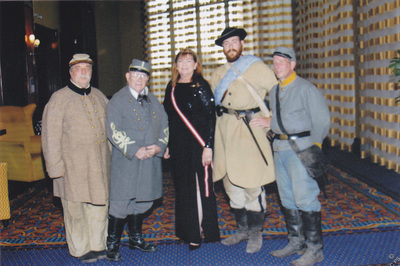 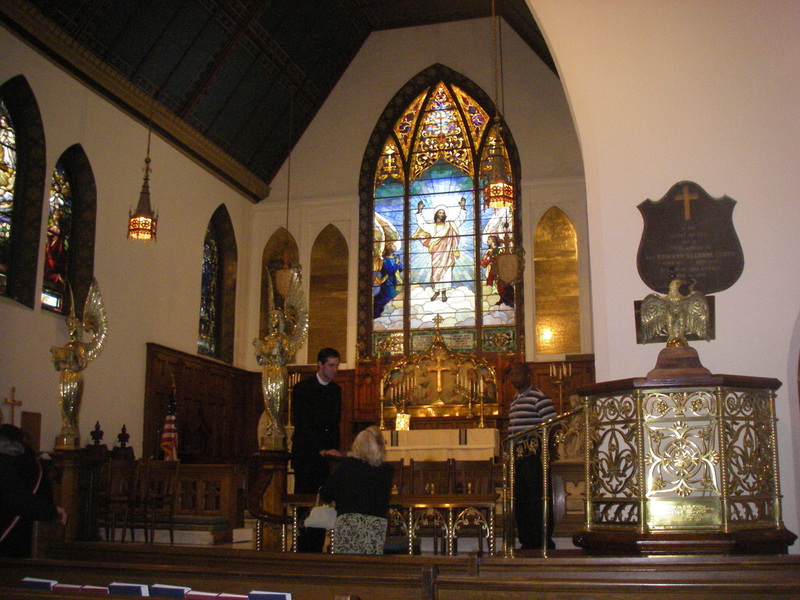 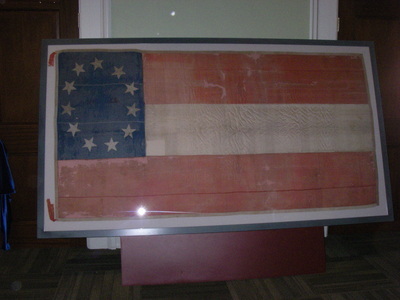 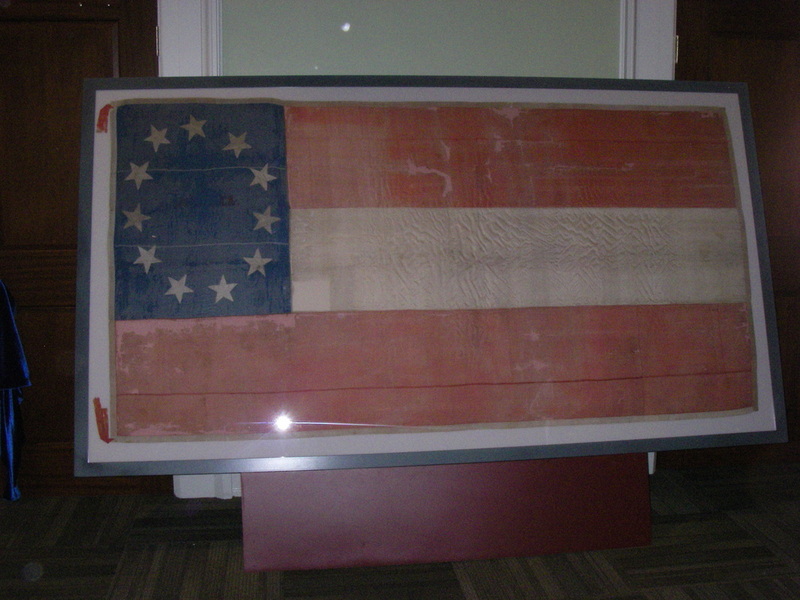 Sandie Ziglar led us all in salutes to the Christian Flag, U. S. Flag, Alabama Flag, Confederate Flag. 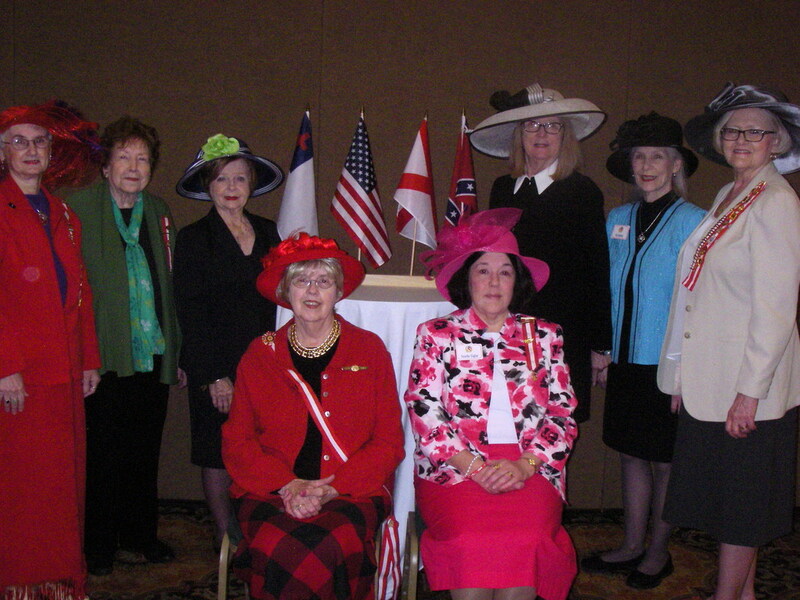 Everyone then sang "Alabama". We all enjoyed a great lunch. 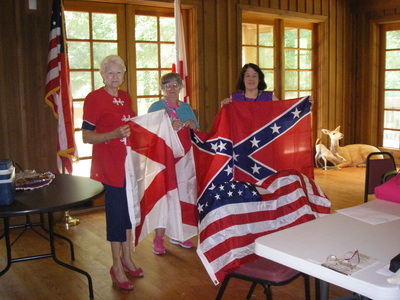 A program was presented by Shelia Shell - "Woven Into the History of Alabama". 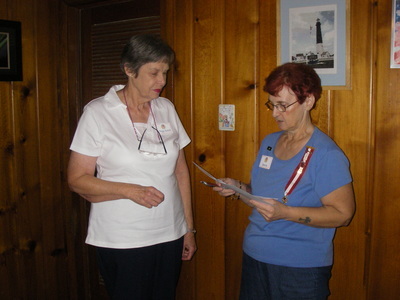 Sandie receiving her President's Pin. Llene receiving her ancestor bar. 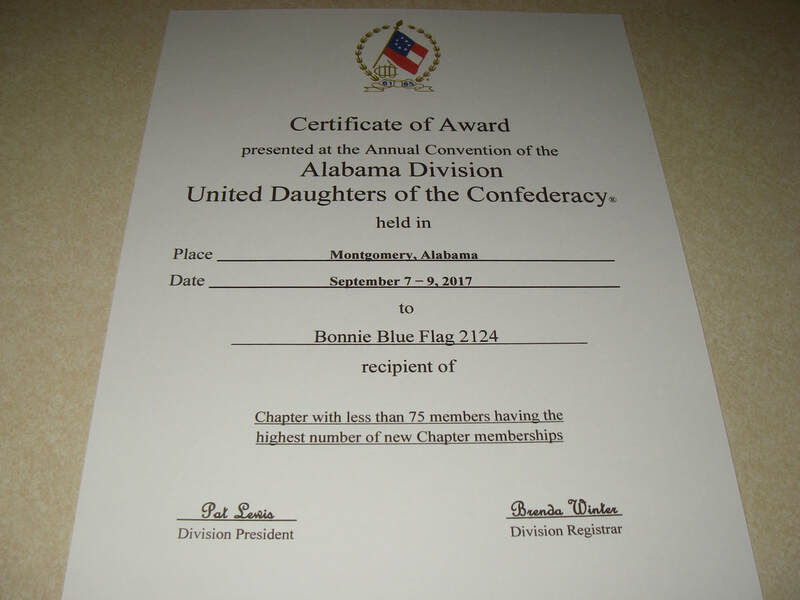 The name "United Daughters of the Confederacy" is a registered trademark of the General Organization and may not be used outside the Organization without the express written consent of the United Daughters of the Confederacy. 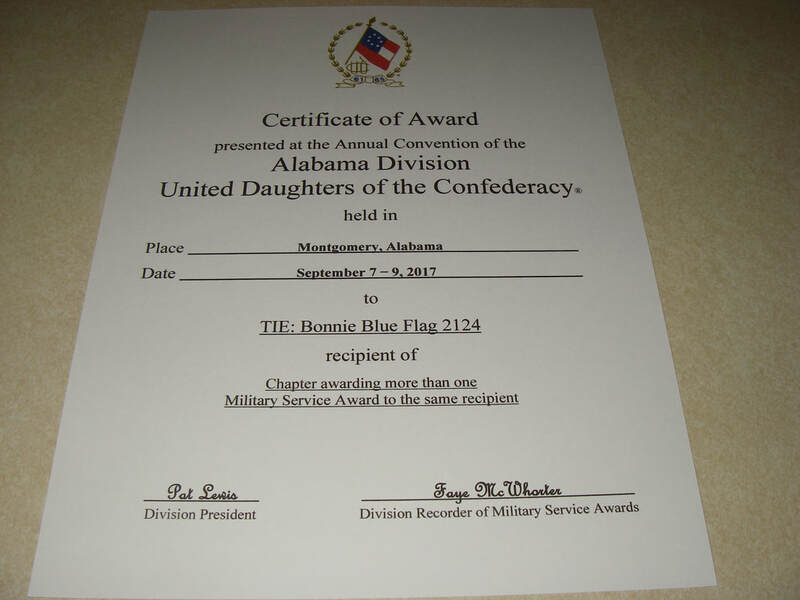 The official UDC insignia is a registered trademark of the General Organization and may not be used without the express written consent of the President General.